THE WEAVING OF THESE TAPESTRIES BY GABRIELA CRISTU ONLY . 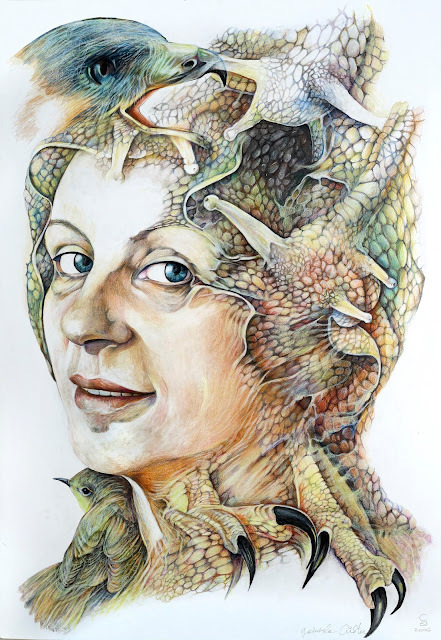 Imaginile lucrarilor sunt proprietatea artistului si sunt protejate de legile dreptului de autor, in temeiul articolelor din Codul de proprietate intelectuala. 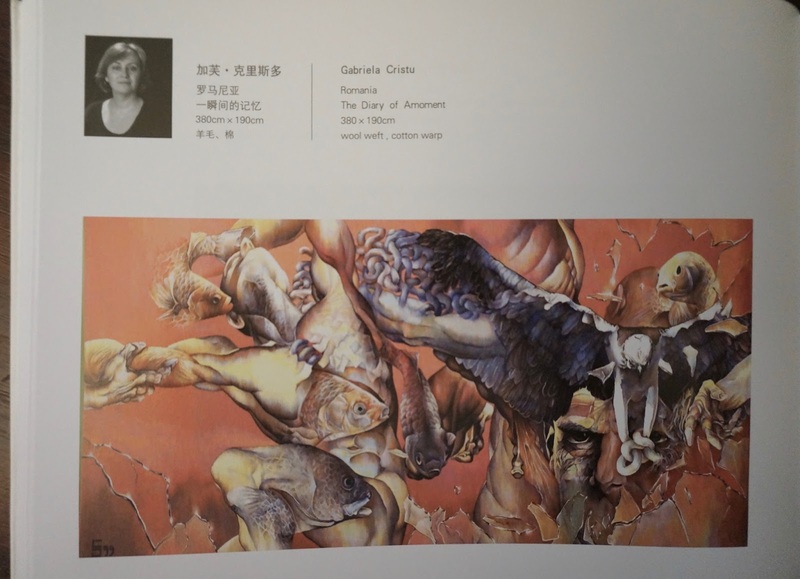 The Images of the works are protected by the copyright laws.
" It always was the human being that inspired me. 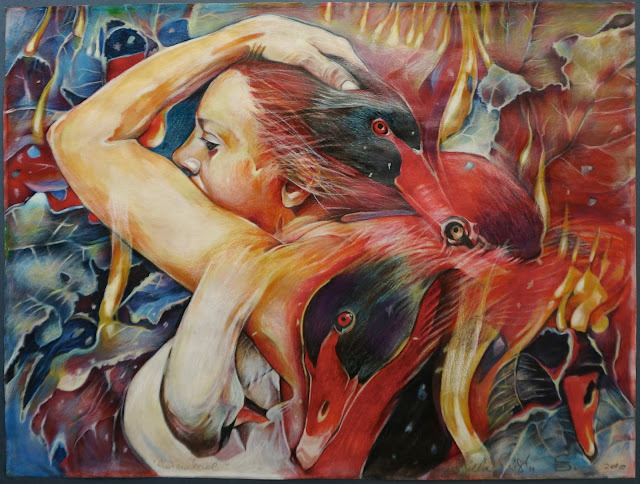 EVERYTHING happens around it and I love to discover its magic, to draw in scapes, a feeling or a message, to capture what cannot be rendered in words. 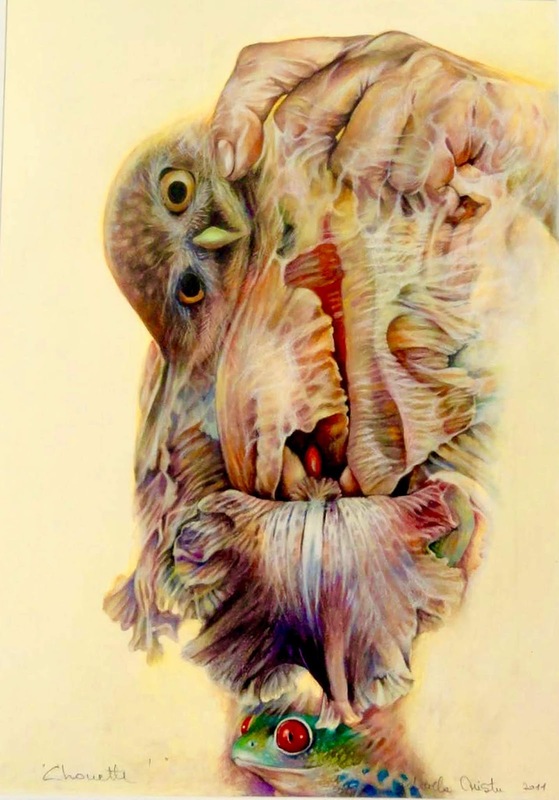 To draw as if there were not sufficient words around, only images which, brought together, trigger frames of mind; similar to bringing substances in a crucible. My original idea is metamorphosed with a clarity that is difficult to explain according to any logic. Just like our lives. 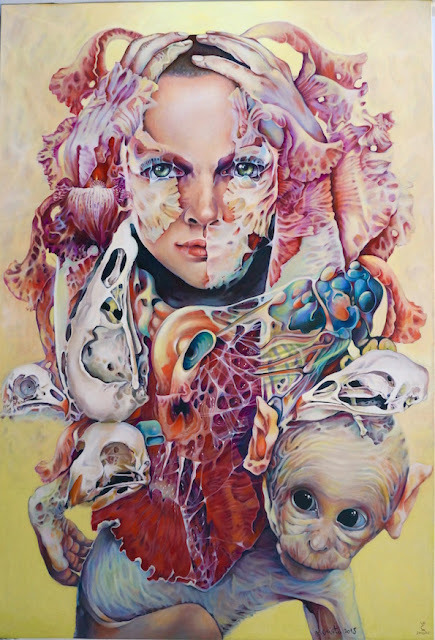 In my work the human being is I. " " They say that no artist creates for himself. 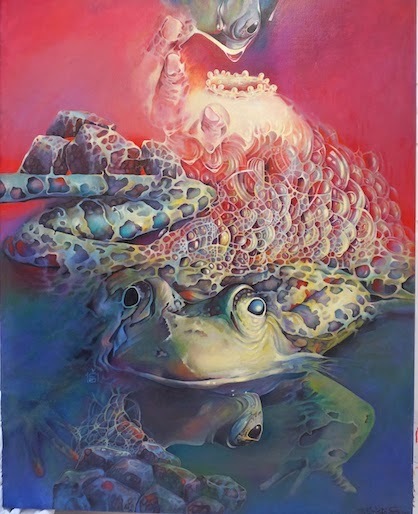 My convinction is that an artist primarily creates for himself and only afterwards, once his work is completed, does he wish to share his revelations someone else. 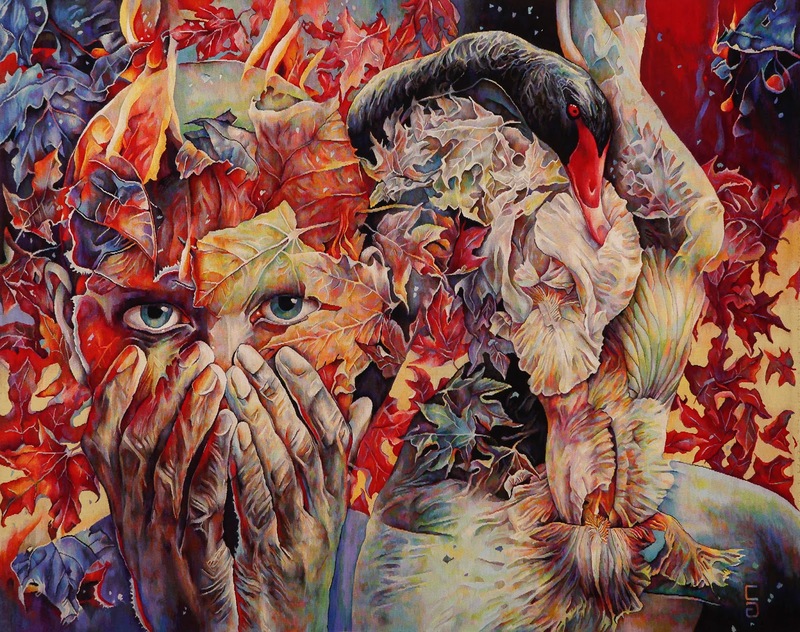 In equal measure spiritual, emotional, imaginative, and phisical, my work is my rationale to be. " 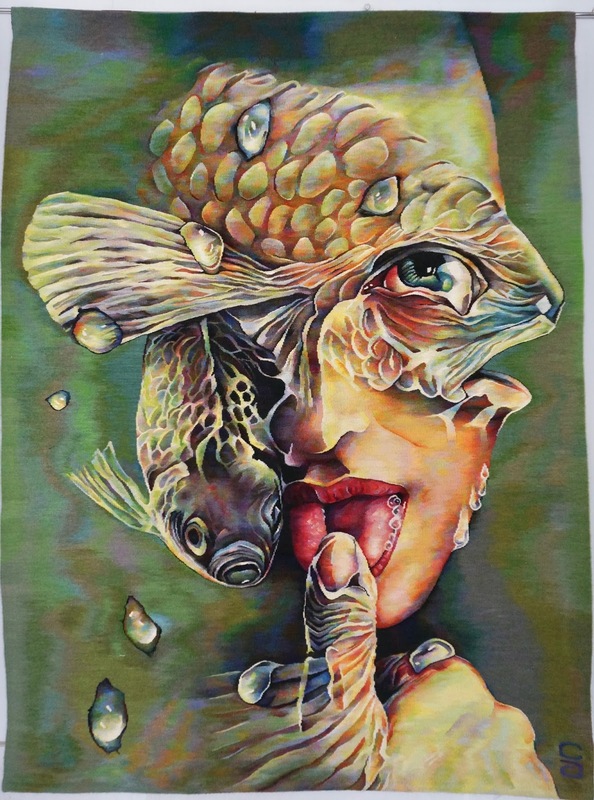 " Tapestry never ceases to surprise us. 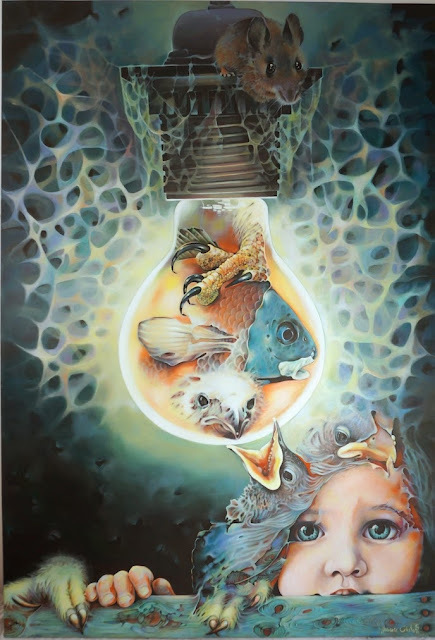 I have the feeling that there is still is something mysterious in it waiting to be discovered (or rediscovered), precisely because it offers such a large array of opportunities for expression technically speaking. It is inexhaustible. Yes, I do consider that it is very important for an artist to weave his or her tapestries in person. These works become autographs. 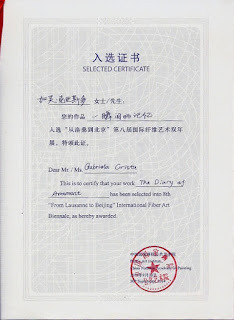 They resemblecodices, and are thus very valuable. " 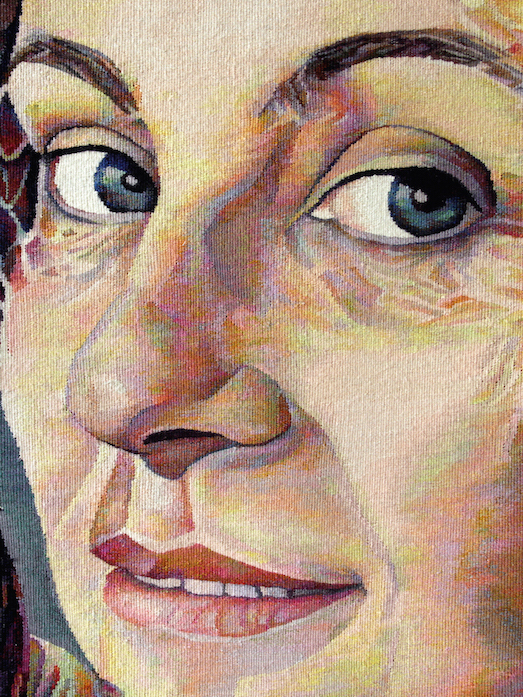 From the Easel to the Loom and come back again. 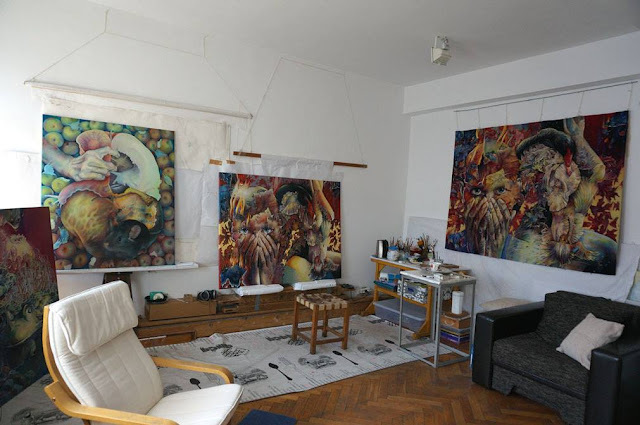 I have chosen the genre of tapestry long before I begun doing it, since I was studying at the Academy of Arts in Bucharest. 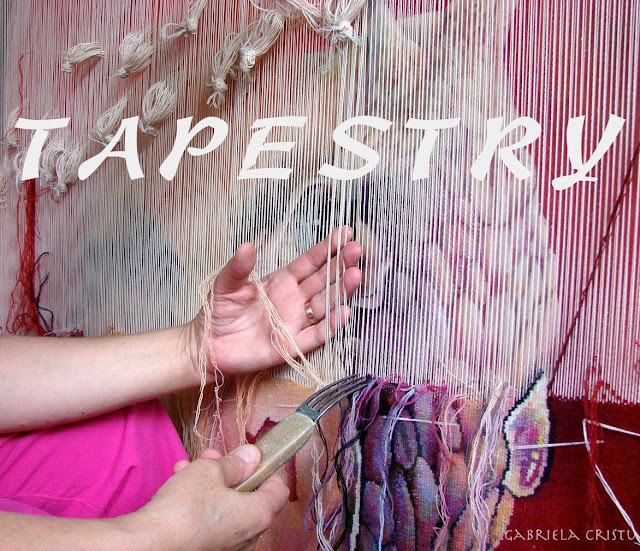 Our study workshop was next to the workshop with many looms of those who were making tapestry and through which I was passing every day. I still see it in front of my eyes. Daring and monumental are the word which best describe that space. 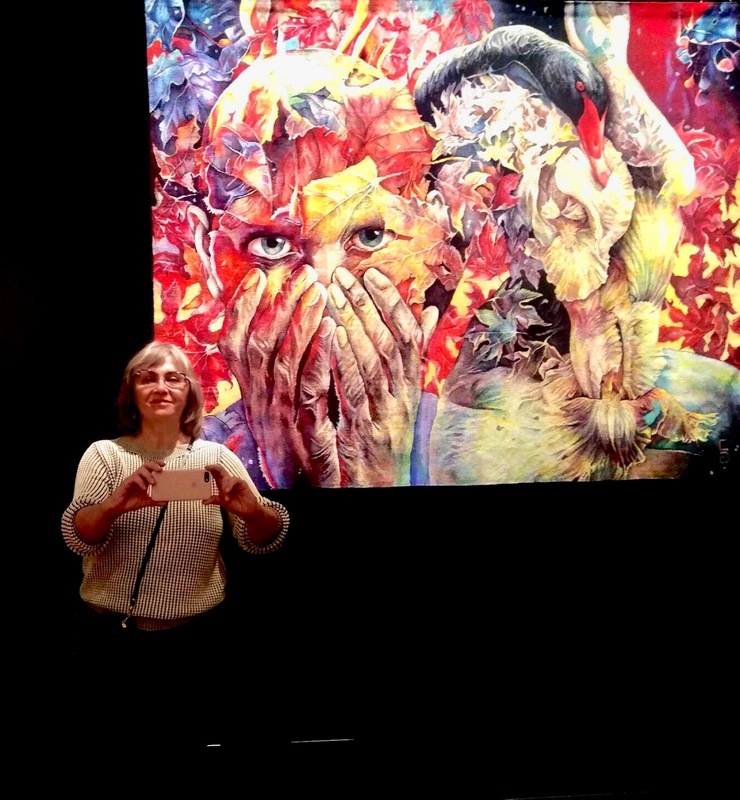 During this time I was working, painting, drawing and opening the exhibitions. 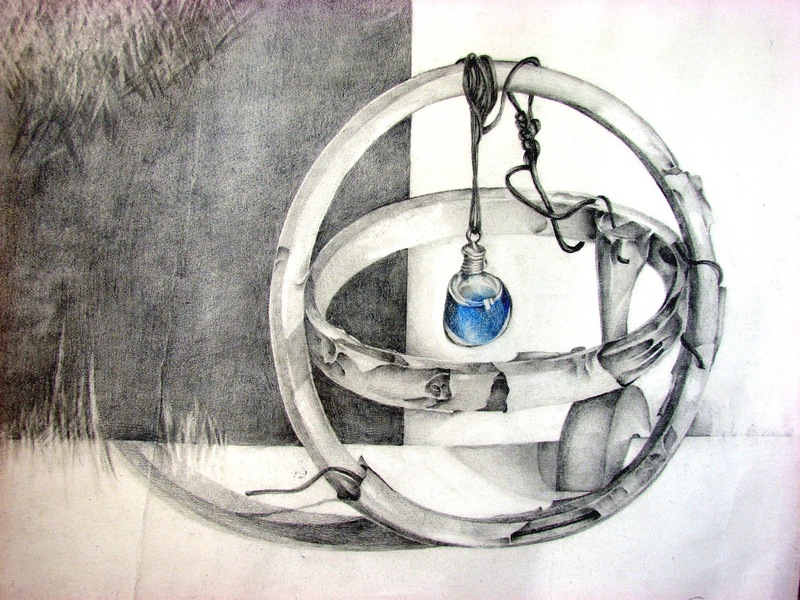 With the profound feeling that the works I was creating were just an intermediate step. 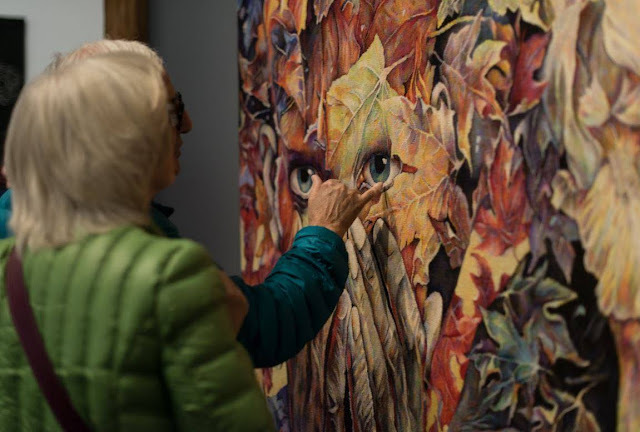 It was a prolific period of searching, of understanding my own artistic personality, a time of meticulous inner preparation for a new form of expression, of the tapestry. 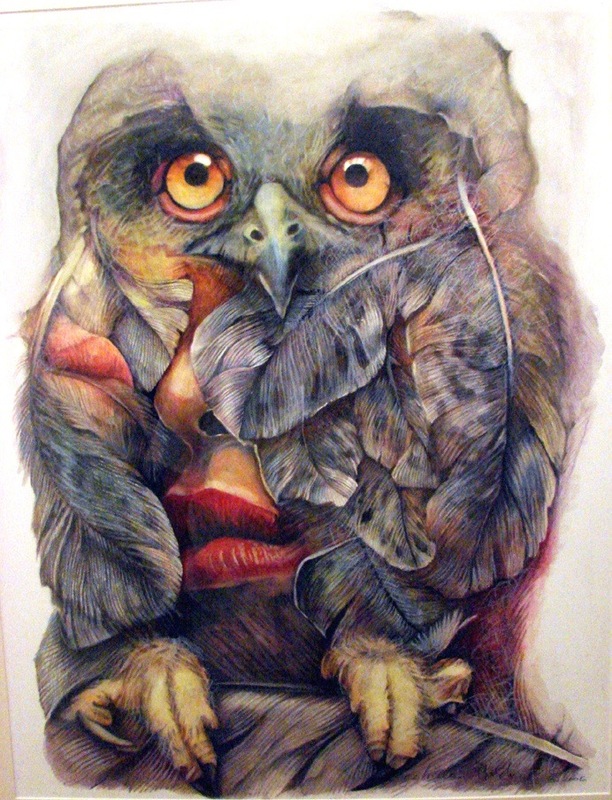 And also during that time the drawing became more suggestive, the tempera became more accurate, the paper was continuously changing its dimensions and it seemed as if I did not have enough space. 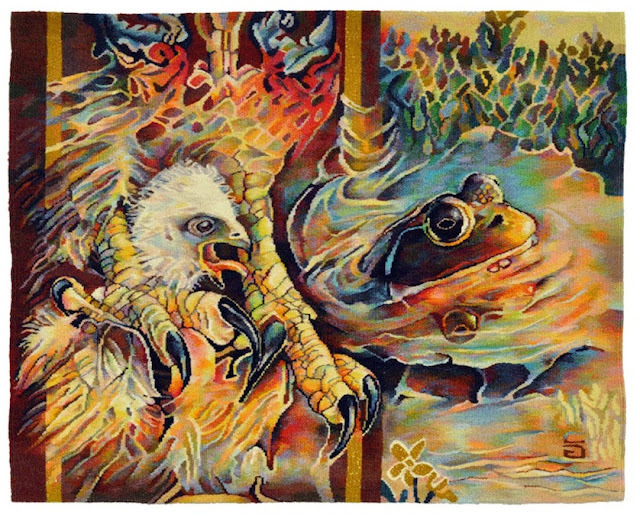 This is how I discovered that not every thing I was imagining in painting or drawing I could do in tapestry as well. And vice versus. I was thinking and imagining them differently. 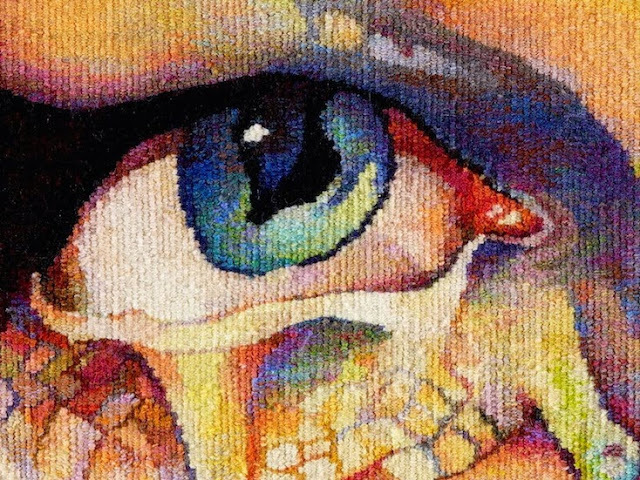 Until one day when I decided to approach the tapestry loom. With no hesitation. 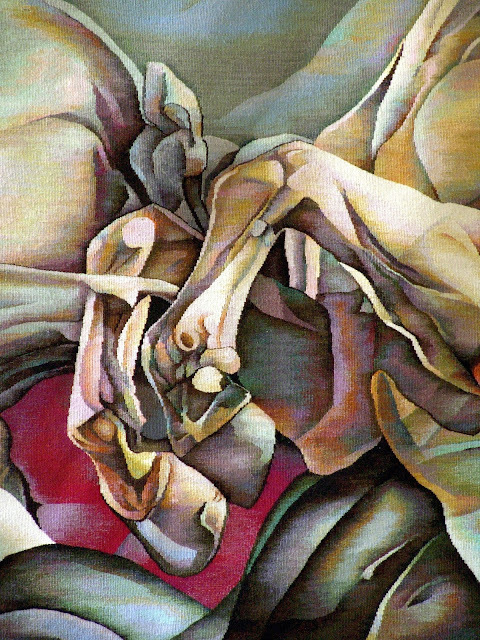 That feeling of provisional disappeared and, since then, I am able to say it again, I have never ceased to discover this wonderful form of expression - the tapestry. 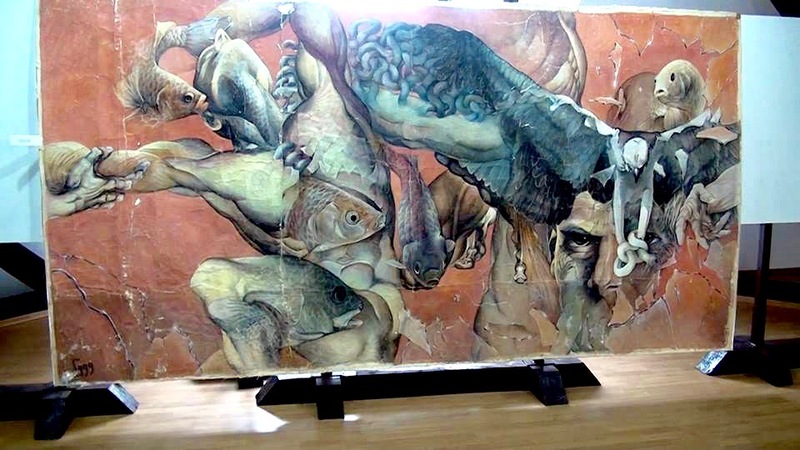 In my opinion, it is comparable with the mural painting because it has a different consistency and another timbre than canvas painting or cardboard drawing. It is entirely special. By the tapestry I am perfecting the drawing on paper and especially the painting too. 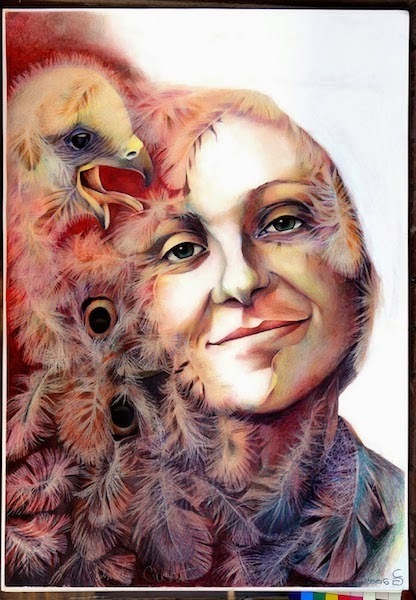 I would say that all techniques I tried influenced themselves mutually and perfectly suited me. 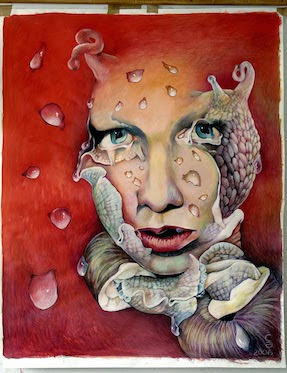 In the beginning I used to draw, then paint and experimented with various textile materials. 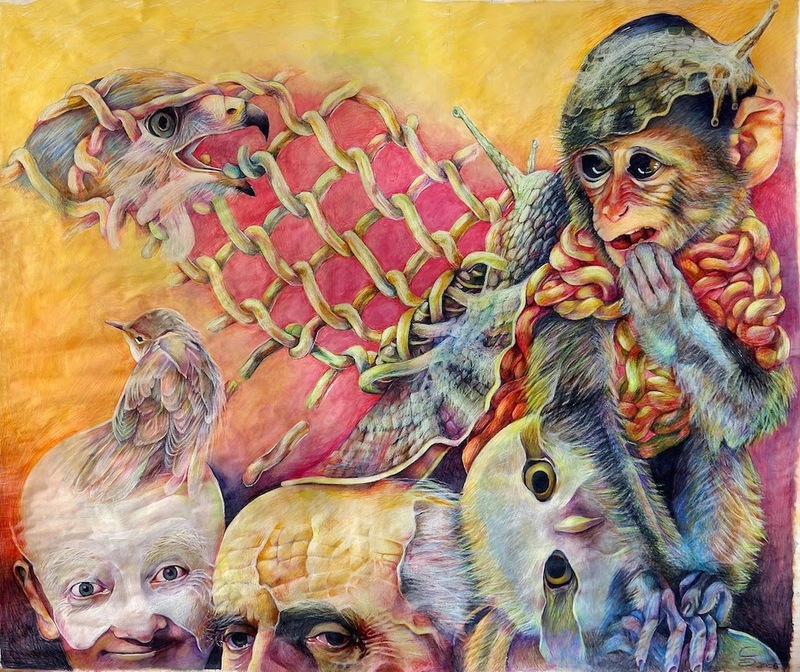 I discovered my own modality of drawing in volume and colour with textile colorants in the technique of printing on an adequate textile for wall hangings, which in exhibitions looked like tapestries (but they were not). I used to work on this material in ever larger dimensions and I would learn how to compose and balance ideas on such surfaces. 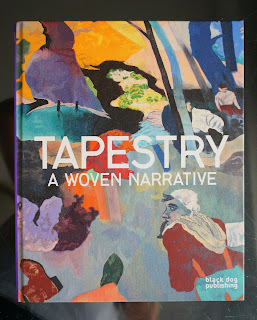 Due to these works I deliberately took the path of tapestry. 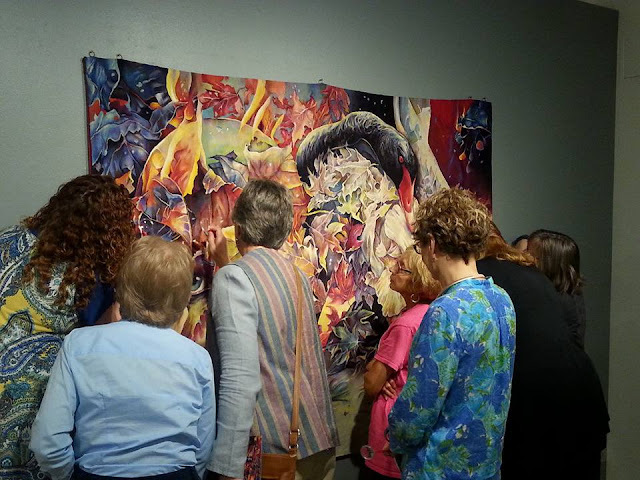 After years of working with tempera, gouache and crayons for the projects of my tapestries and afterwards the tapestry itself, the switch to painting was facilitated. I had already found the style I liked, I knew what ideas I favoured and how to make my layout. I only had to learn about the new painting materials and experiment with to see what suited my style. And I am not done with it yet. The one who says that tapestry is a minor art is wrong: painting is as fascinating as weaving tapestry, anyway the feeling that I am an accomplished artist comes from my doing tapestry and also because I personally do my own works. Gabriela Cristu. 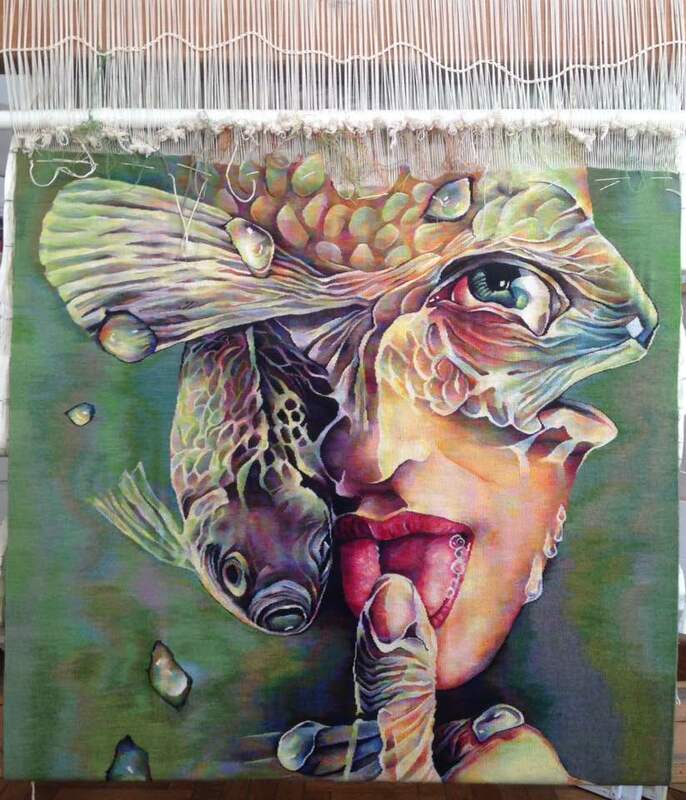 161 / 210 cm, 2016-2017.
tapestry haute-lisse, 190 / 370 cm, 2001.
tapestry haute-lisse, 300 / 200 cm, 1995. 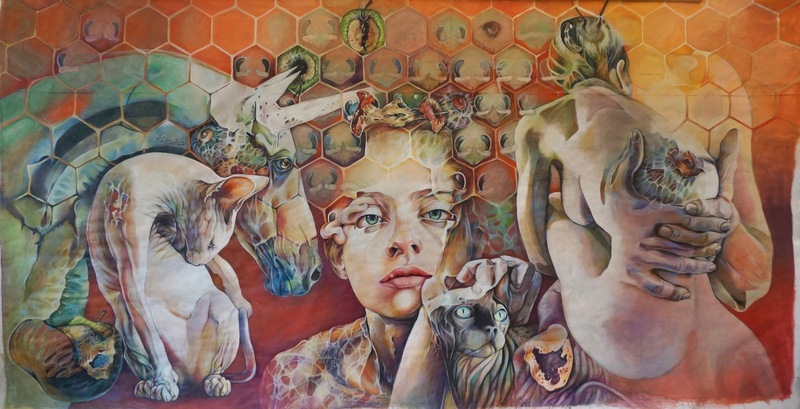 Group Exhibition, CEC Gallery - Sibiu, Romania. 2007. 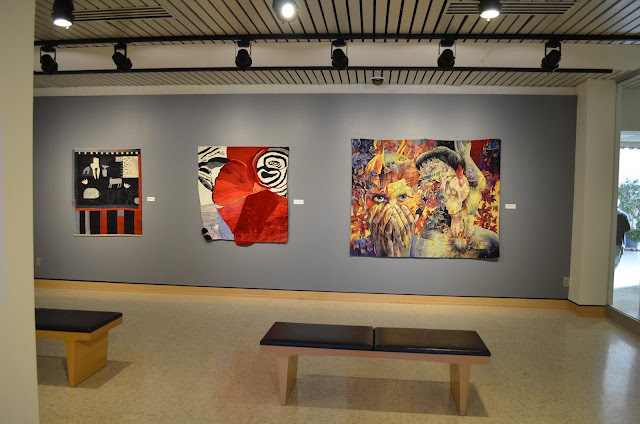 2008 - The University of Tampa, Scarfone/Hartley Galery, Florida, USA . 270 / 166 cm, 2005. 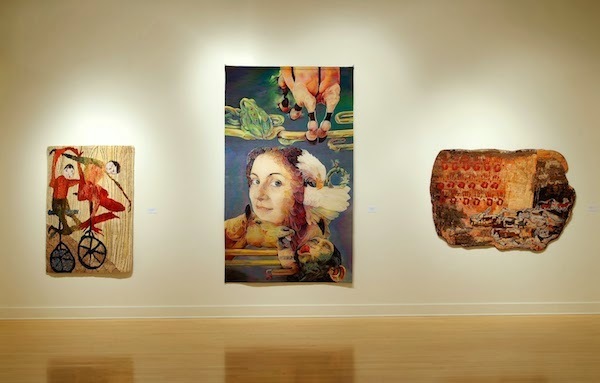 2008 -The University of Tampa, Scarfone/ Hartley Gallery, Florida, USA. 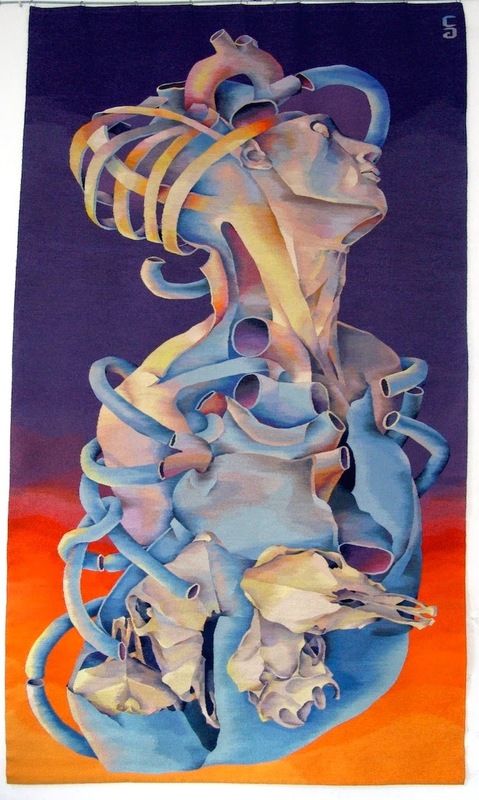 tapestry haute-lisse, 150 / 150 cm, 1998. 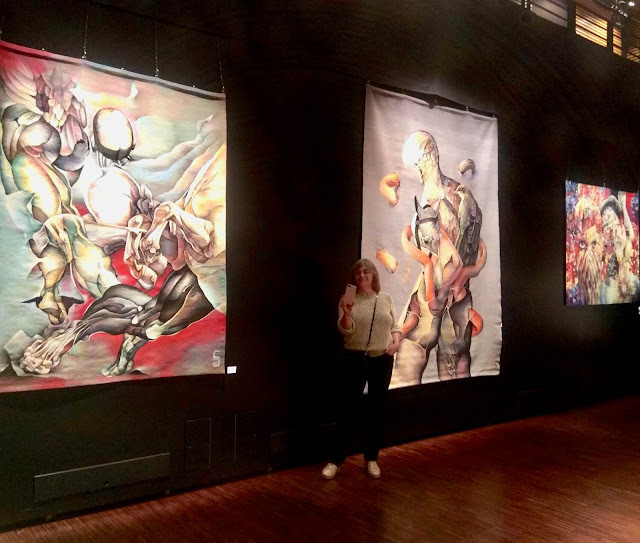 Exhibition "Salonul Artelor Decorative" at the Cotroceni Museum, Bucharest, 2013.
" Salonul artelor decorative " exhibition at the Cotroceni Museum Bucharest, 2013. 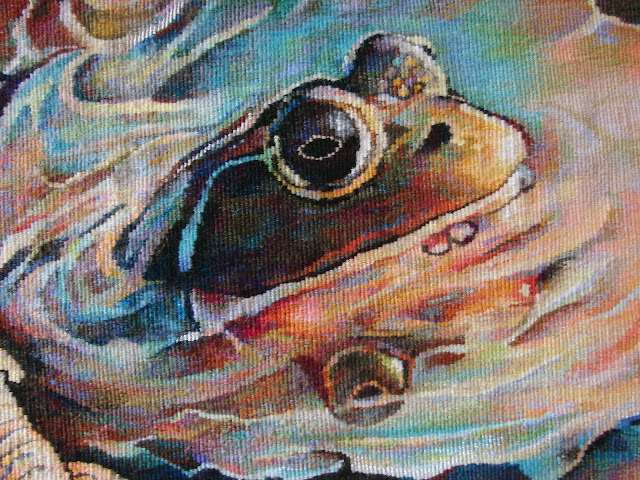 Artapestry 2 exhibition, Bergen, Norway 2009. Artapestry 2 exhibition, Aalborg , Denmark, 2009. 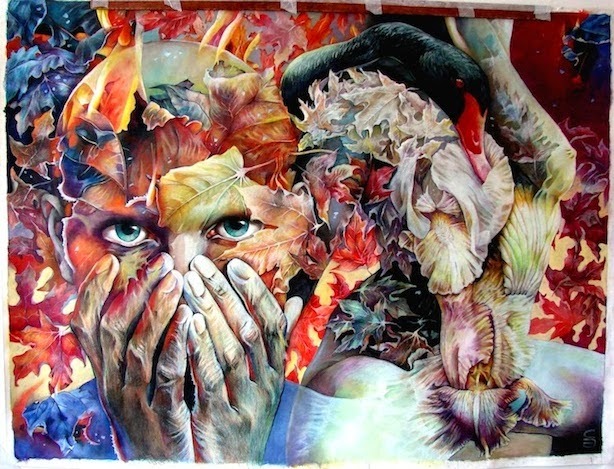 PRELUDE TO THE AFTERNOON OF A FAUN, tapestry haute-lisse, 150/190 cm, 2014. 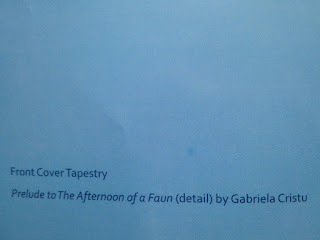 PRELUDE TO THE AFTERNOON OF A FAUN, tapestry detail. MULVANE ART MUSEUM, Topeka, Kansas, SUA. ( photo-credit Mulvane Art Museum ). 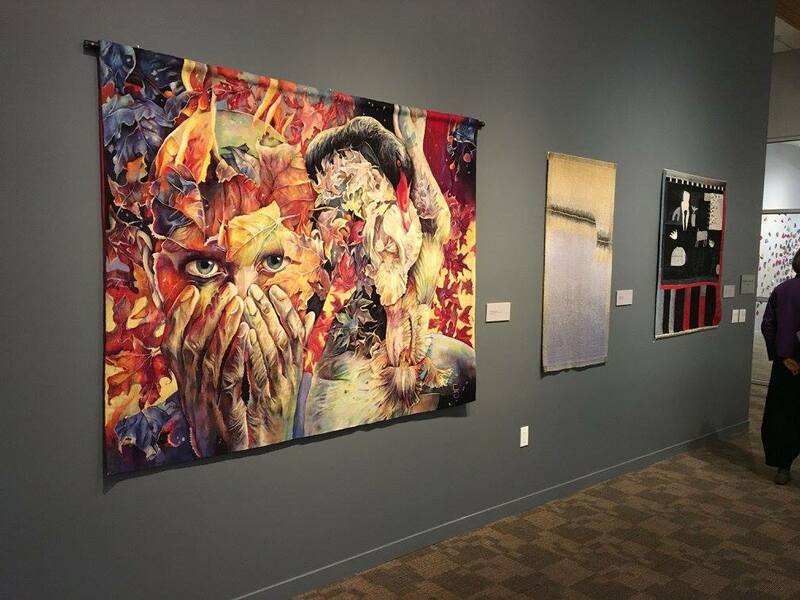 2017 - San Jose Quilt & Textiles Museum, California, SUA.
" 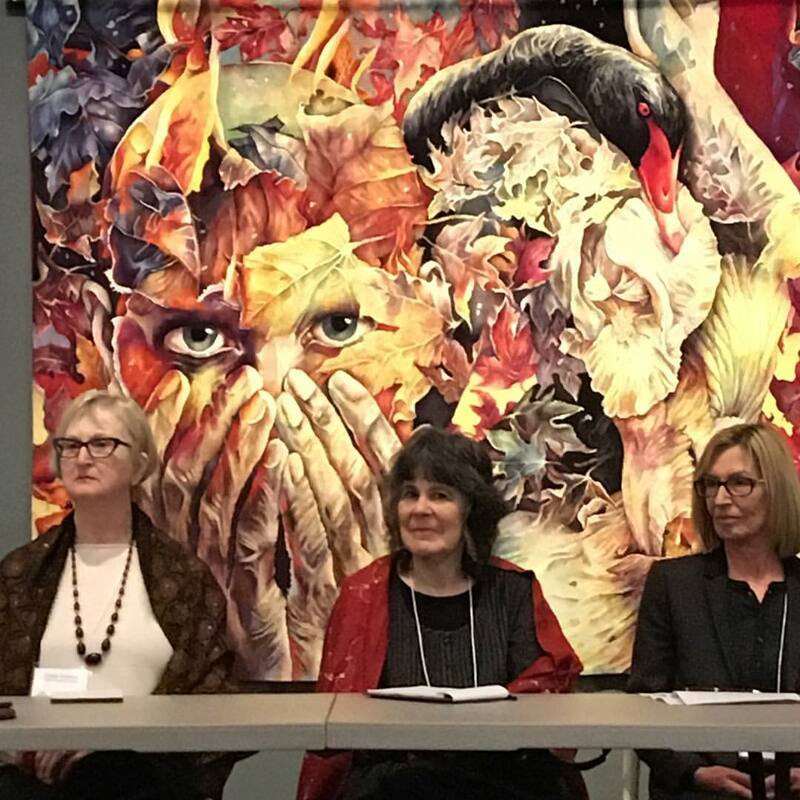 Look at tapestry powerhouse.Linda Walllace, Barbara Heller, and Marie Thumette-Brichard. They were part of panel discussion at the American Tapestry Biennial 11 opening in San Jose. The tapestry behind them is by Gabriela Cristu"
She also works the painting and the drawing . school Ştefăneşti, Argeş county, Romania. 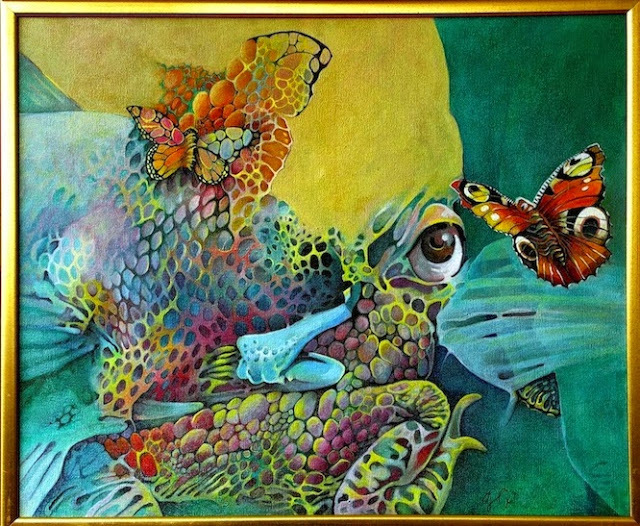 1969 – “ N.Tonitza ” Fine Arts College, Bucharest, Romania. 1973 – MFA of “ N.Grigorescu ” Fine Arts Academy, Bucharest, Romania. 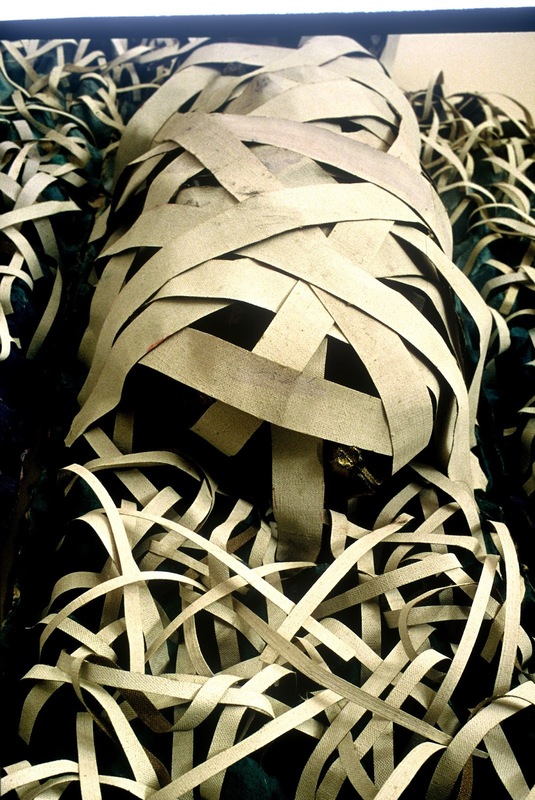 1973 – 1974 – Specialized as part of the Academy of Fine Arts, Bucharest, Romania. She works also tapestry, drawing, and painting in oil on canvas.
" I draw directly on a cardboard of the size of the future tapestry, without a prior sketch for. My ideas and the images are not processed in Photoshop, because I do not like to use the digital techniques. 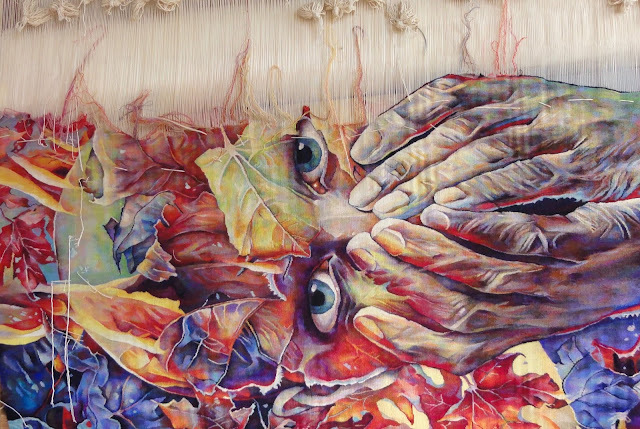 The ideas are make directly on the canvas painting or the tapestry cardboard. 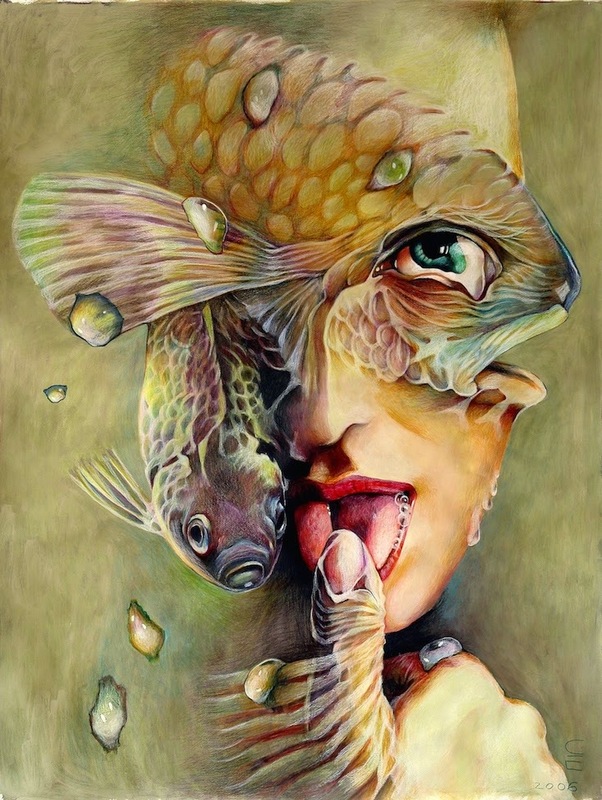 I just use my imagination. 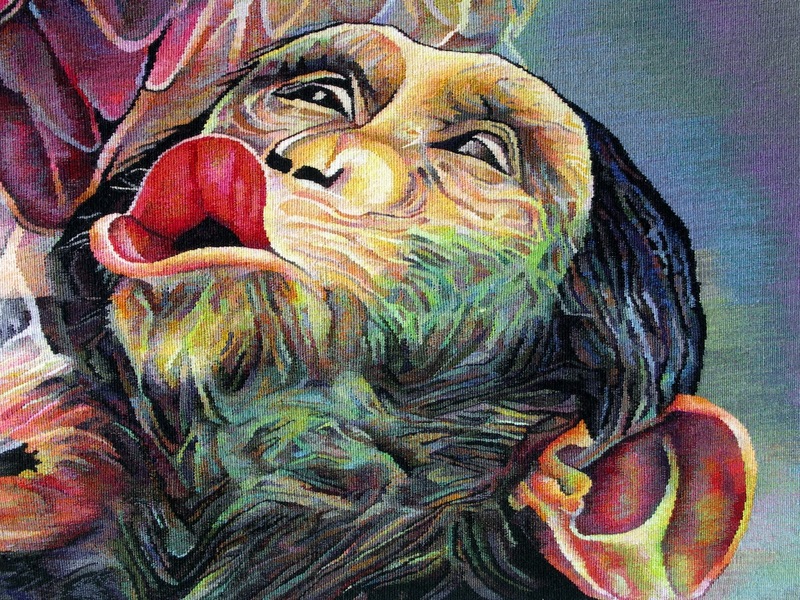 I always weave the tapestries myself, in my own style. And in the space and time between two tapestries I make other drawings and I also paint in oil on canvas. Not the print-painting, not the photocopy-painting ". Gabriela Cristu. 1980 – UAP – Romanian Artists's Union. 1991 – ARELIS – French Association of Tapestry,Paris, France. 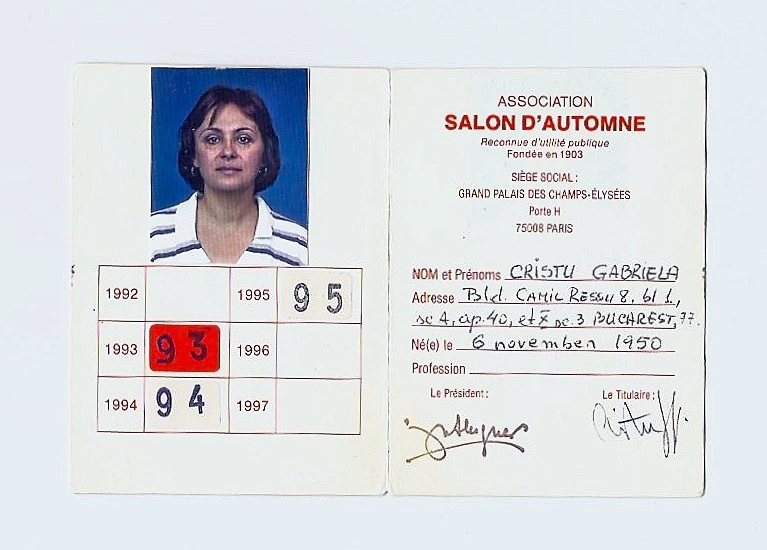 1992 – Admissed as a member of the “ Salon d’Automne ”, Paris. 2004 - ETF - European Tapestry Forum, Denmark. 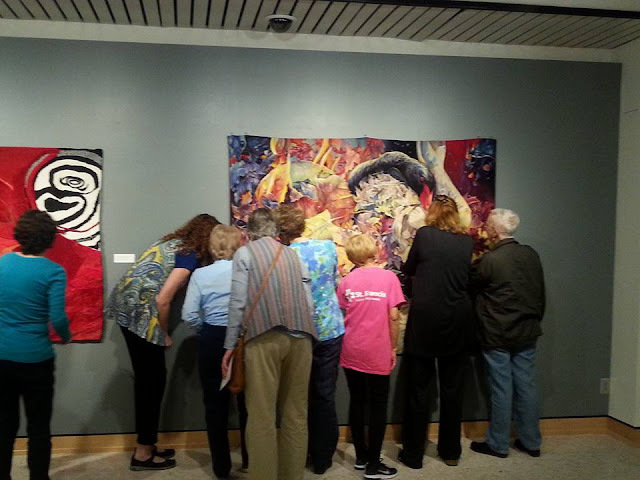 2015 - ATA - American Tapestry Alliance, USA. 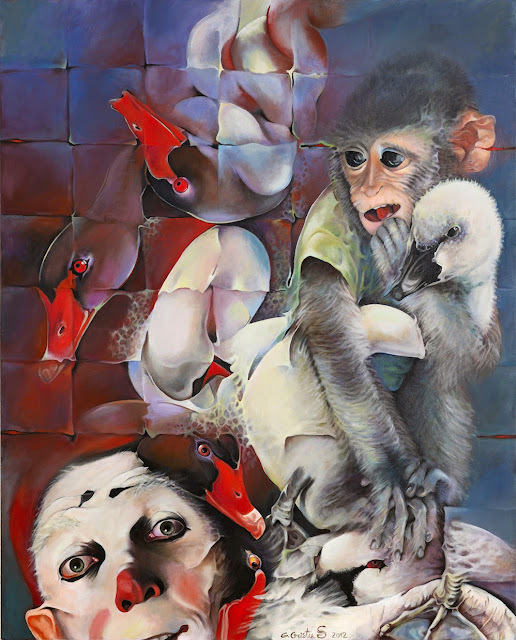 2018 - Fondation TAYLOR, association des artistes, Paris, France. 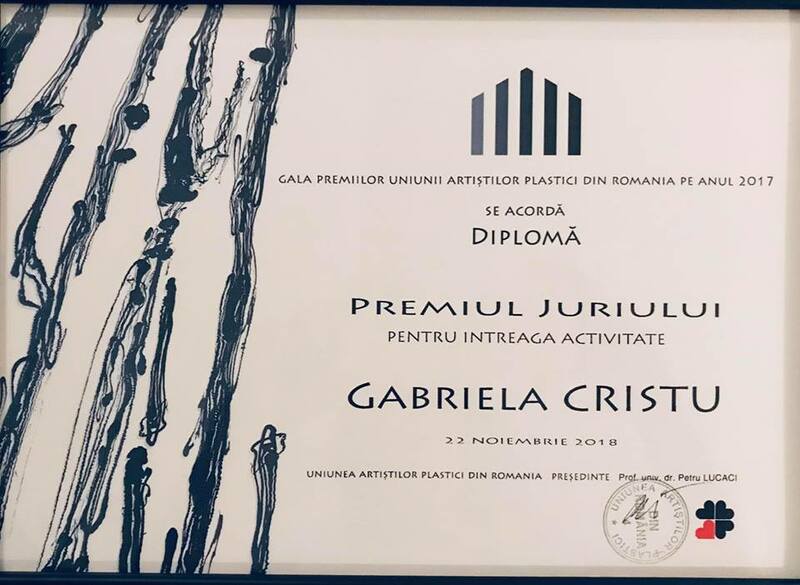 2018 - Jury Award from Romanian Artists's Union for my whole creative activity. 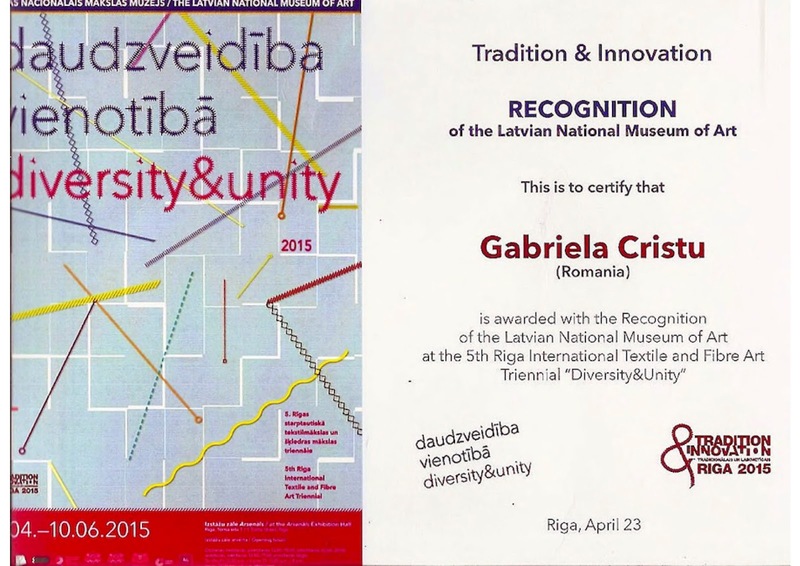 2015 - Recognition of the Latvian National Museum of Art, 5th International Textile and Fiber Art Triennial exhibition " Diversity & Unity ", Riga, Latvia. 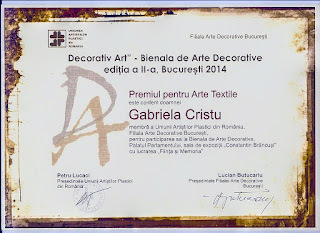 2014 - Award for the Tapestry, Decorative Arts Biennial, Bucharest, Romania. 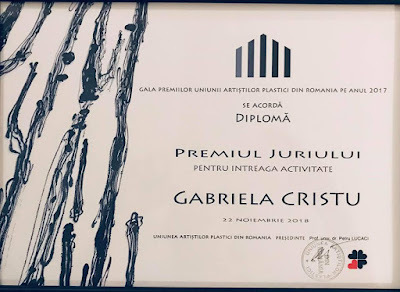 1995 - Award for the Drawing, Salonul de Arta, Tg-Jiu, Romania. 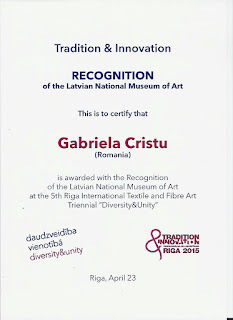 1993 - Award for the Tapestry, Salonul National de Arta, Bucharest, Romania. 1978 – " Hanul cu tei " Gallery,Bucharest, Romania. 1980 – " Eforie Gallery ", Bucharest. 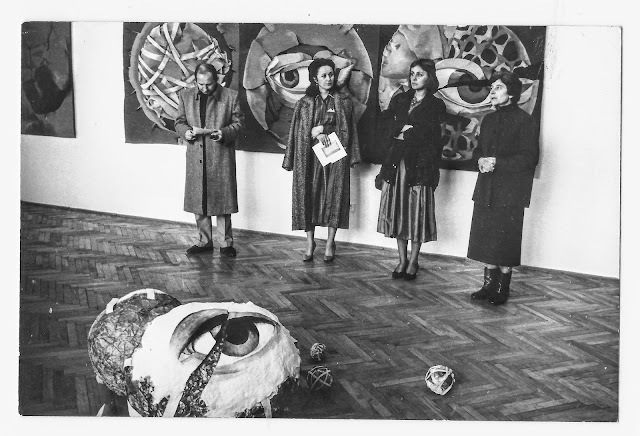 1985 – " Simeza Gallery ", Bucharest. 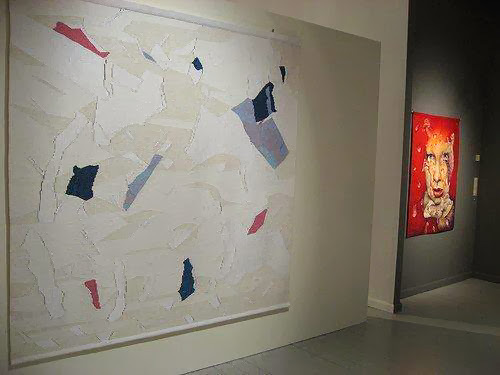 1998 – Fondation Artexpo, 3/4 Gallery, The National Theatre, Bucharest. 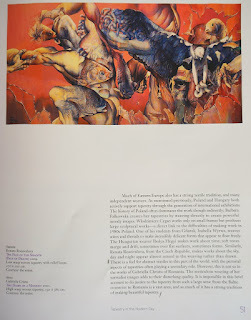 2002 - The Brukenthal National Museum, Sibiu, Romania. 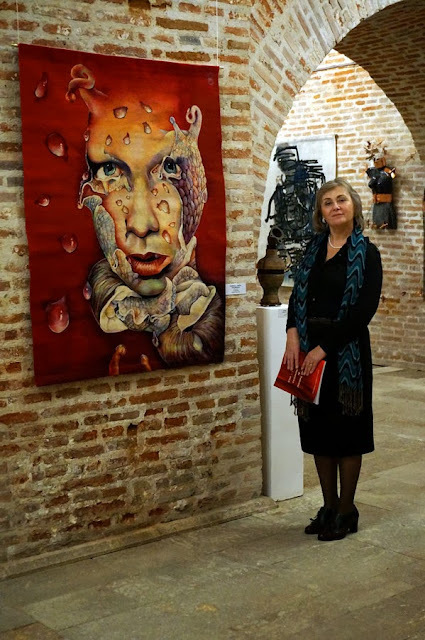 1977 up to now, she has been taking part in several national exhibitions in Romania. 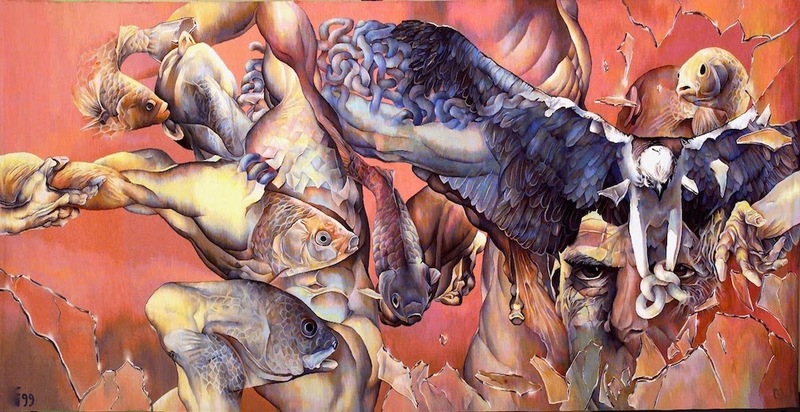 1991,1993,1996,2000 – With ARELIS, Cité Internationale des Arts, Paris. 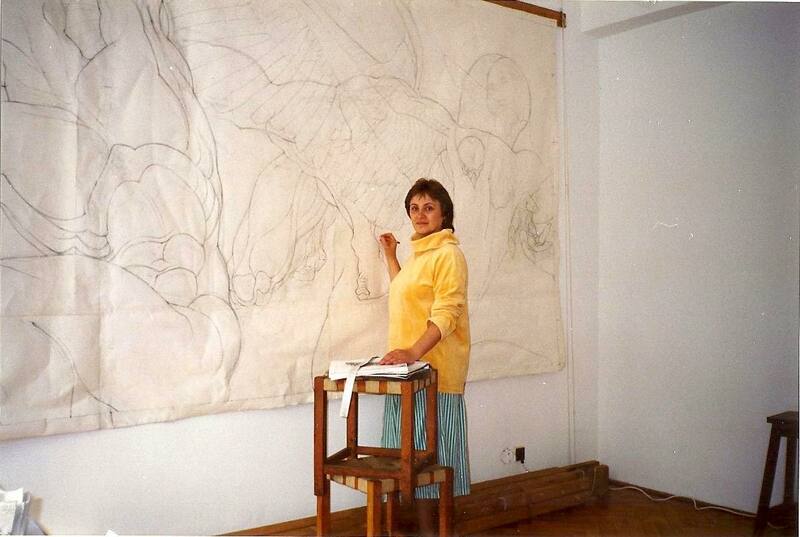 1992 – The Drawing Triennial, Wroclaw, Poland. 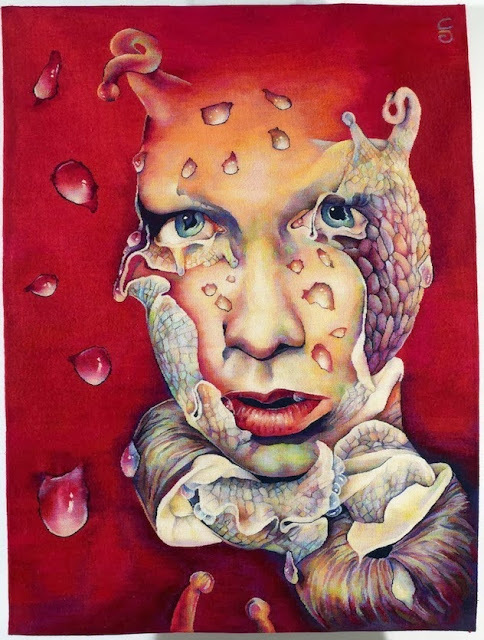 1992 – The First Biennial of Tapestry,Beauvais, France. 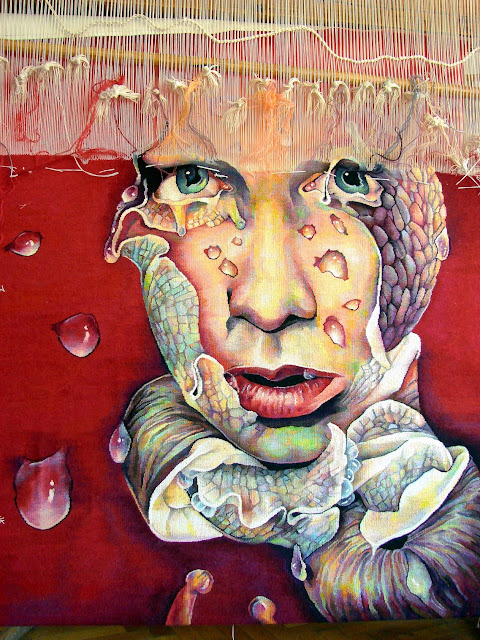 1993 – The Second Triennial of Tapestry “ L’Autre Europe ”, Tournai, Belgium. 1994 – “ De Pièrre en fil ”, Namur, Belgium. 1996 – " Salon d’Automne ", L’Espace Eiffel-Branly, Paris. 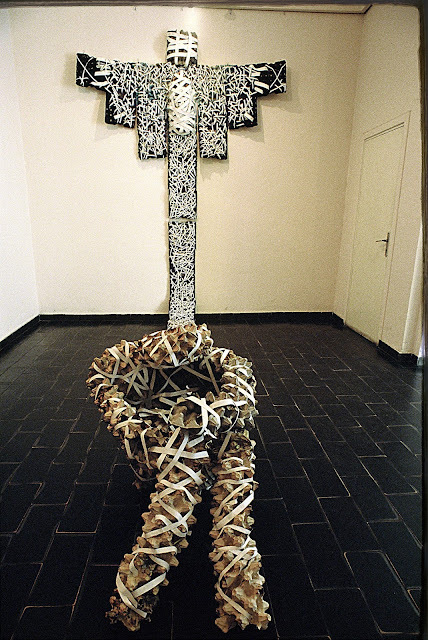 1998 – The First Biennial of Tapestry-Arelis Fiber Artist with Sculptors at Chapel Gallery from Boston, Cité Internationale des Arts, Paris. 1999 – Arelis & Boston Sculptors at Chapel Gallery, Federal Reserve Bank Gallery,Boston, USA. 1999 – “ Realitatea Romaneasca ”, the Romanian Cultural Center, Berlin, Germany. 2002 – Romanian Tapestry, Romanian Cultural Center, Venice, Italy. 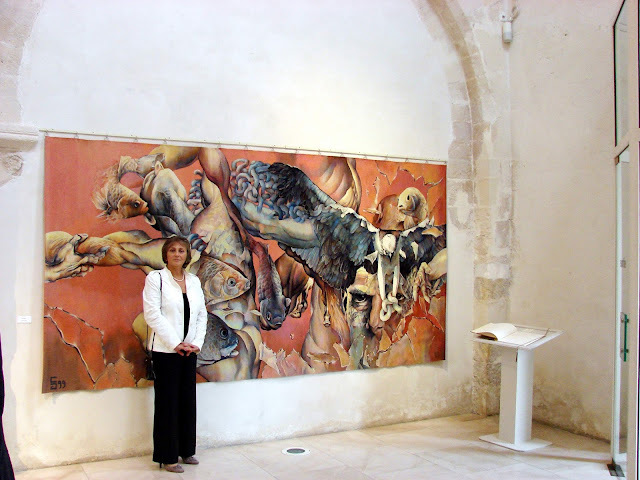 2002 – The 5th International Tapestry Festival, Beauvais, France. 2003 – The 4th International Tapestry Triennial, Bucharest, Romania. Museum ofArt Budapest- Szepmuveszeti Muzeum, Budapest, Hungary. 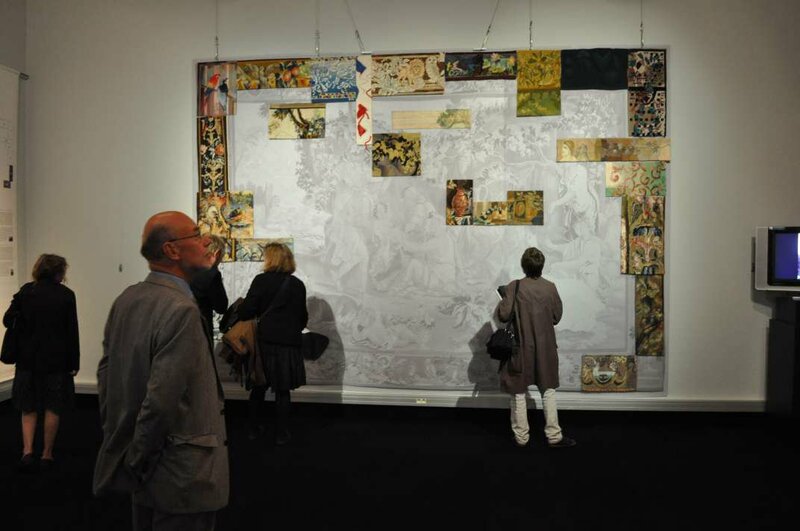 2005 – “ Artapestry ”- the First European Tapestry Triennial at Nordjyllands Kunstmuseum, Aalborg, Denmark. 2006-2007- " Artapestry " - Jean Lurçat Museum, Angers, France. 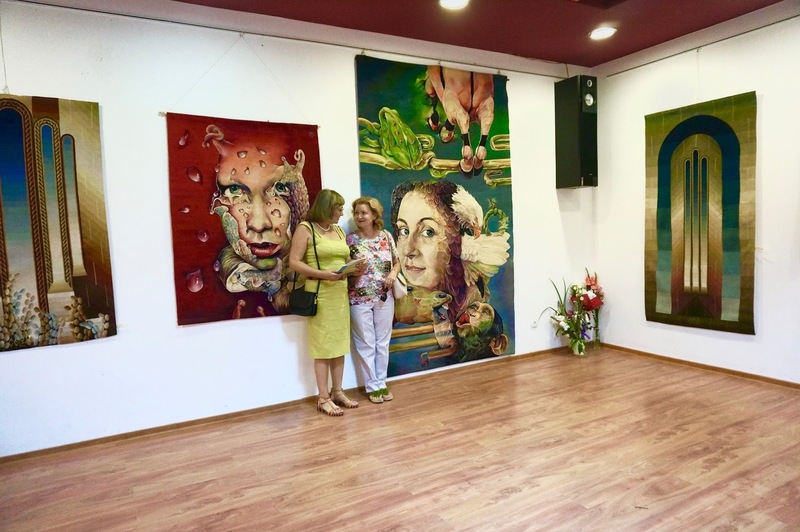 2006-2007- Romanian Tapestry group exhibition, Madrid, La Mancha, Toledo -Spain. 2008 - Tapestry Exhibition, Fine Art Museum, Galatzi, Romania. 2008 - Florean Museum, Deva, Romania. 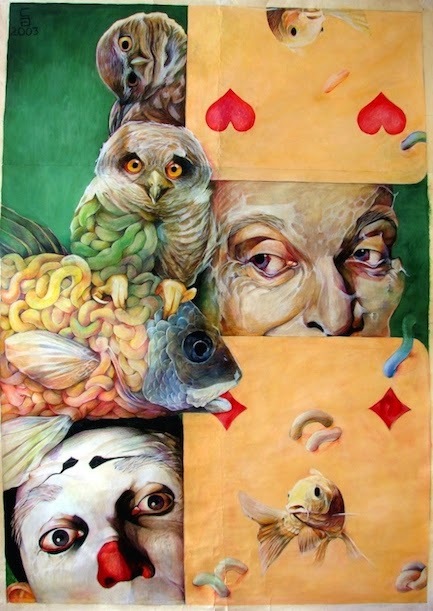 June 16 to July 11 2008 to University of Tampa, Scarfone/Hartley Gallery in Tampa,Florida, USA. 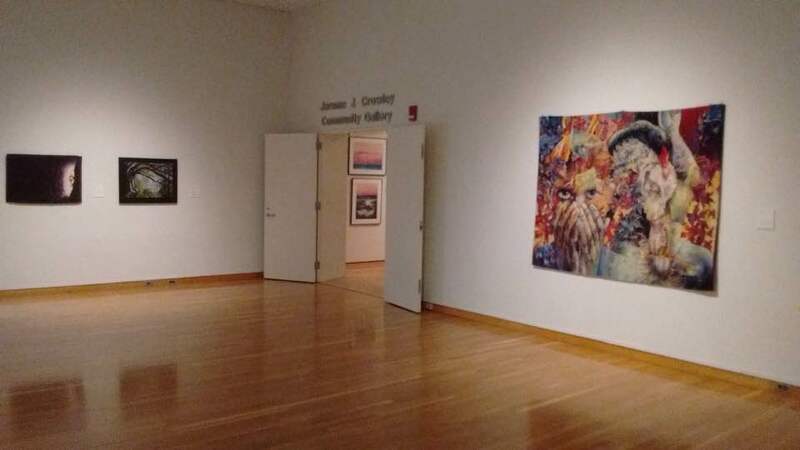 September 6 to December 31- 2008 at Kentucky Museum of Art & Craft Louisville,KY, USA. 2008, 7th november - 11 january 2009 - ARTAPESTRY 2 at NordjyllandsKunstmuseum Aalborg, Denmark. 2009, 7th february - 13 April ARTAPESTRY 2 at Kunstindustrimuseum in Bergen,Norway. 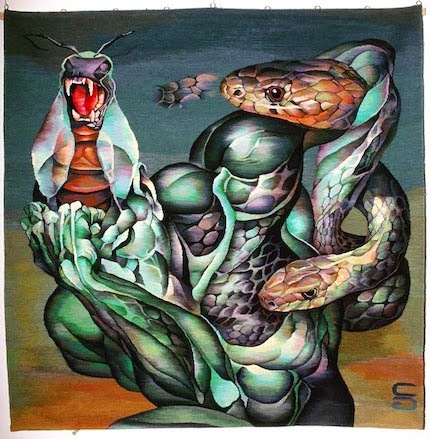 2010 - ARTAPESTRY 2 at Musée Jean Lurçat et de la Tapisserie Contemporaine, Angers, France. 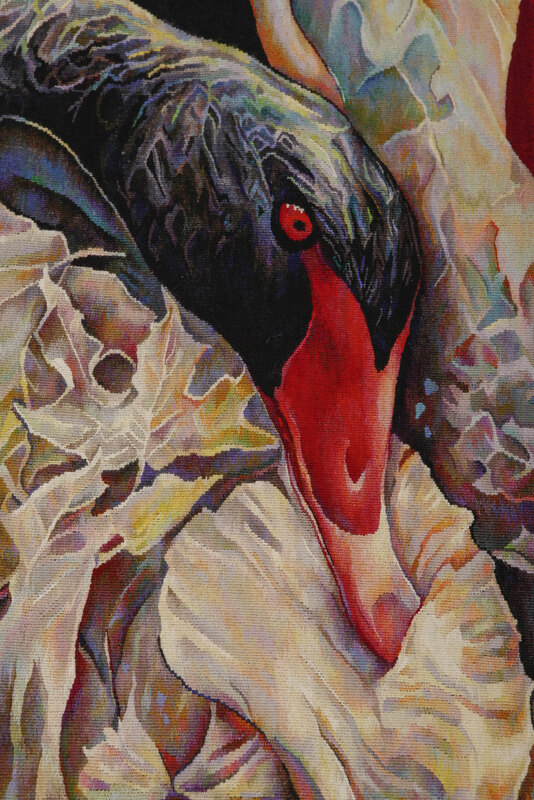 2010 - 28 August - 26 September ARTAPESTRY 2 to Konsthallen Art Museum Lulea,Sweden. 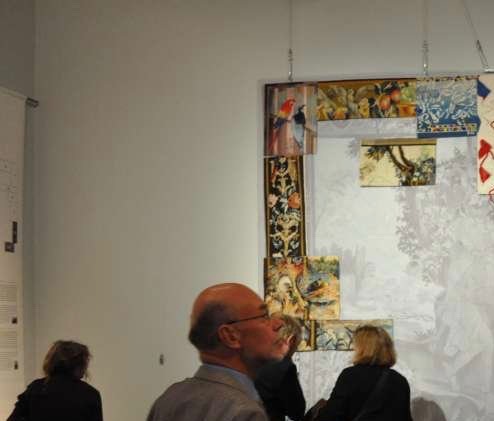 2011 - " Web of Europe " exhibition from 20 May to 14 August, Royal Museums of Art and History-Brussels, Belgium, Contemporary paraphrases of an eighteenth - century Brussels tapestry. 2013 – “ Salonul artelor decorative “ exhibition, at the Cotroceni Museum, Bucharest. 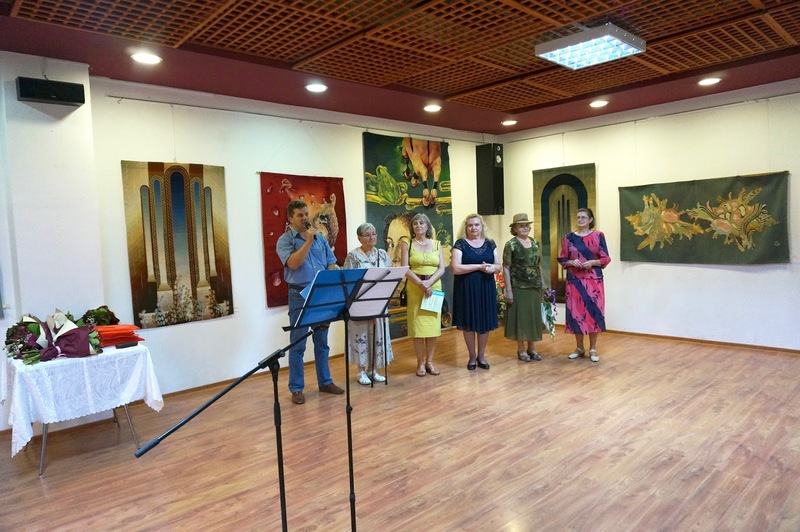 2014 - " Salonul artelor decorative " to the Museum of Art Chisinau, in the Republic of Moldova. 2014 - " Salonul Artelor Textile ", group exhibition, the Orizont Gallery, Bucharest. 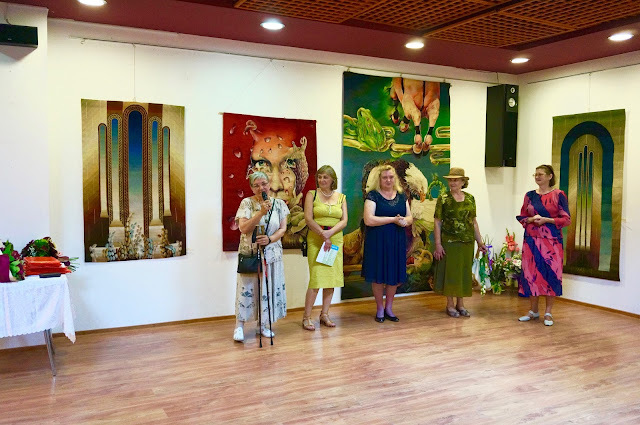 2014 - City Gallery, Suceava, Romania : " Clasic si Modern - tehnici ale tapiseriei parietale " Exhibition of the Contemporary Romanian Tapestry. 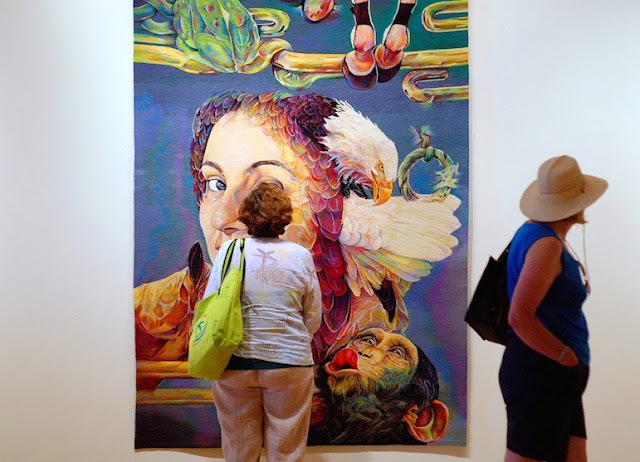 2014 - Decorativ-Art, Decorativ Arts Biennial Exhibition, the II edition, tapestry. Bucharest, Romania. 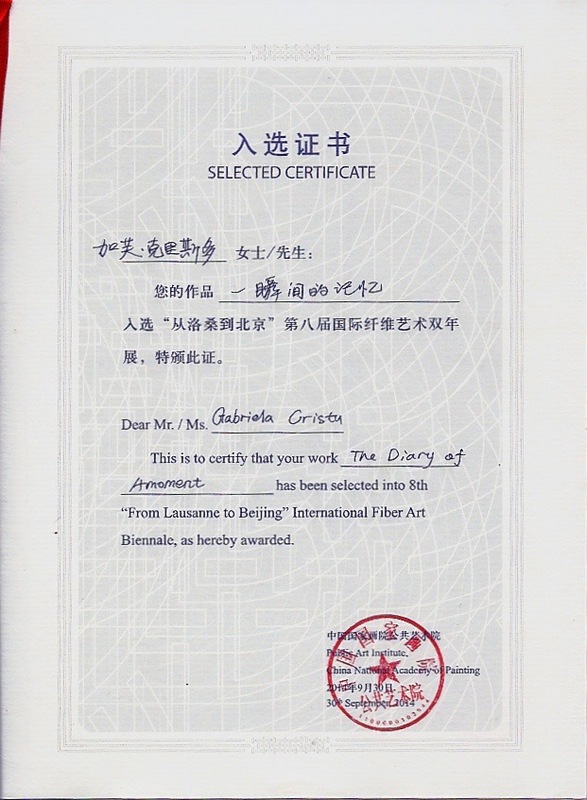 2014 - FROM LAUSANNE TO BEIJING INTERNATIONAL BIENNIAL EXHIBITION & SYMPOSIUM, Nantong - Wuzhen, CHINA. 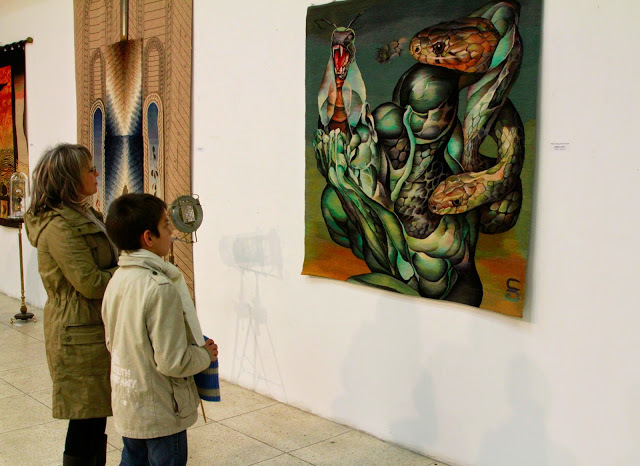 2014 - SALONUL DE IARNA ( Winter Salon ) , the Annual Salon of the Painting 2014-2015, Orizont Gallery, Bucharest, Romania. 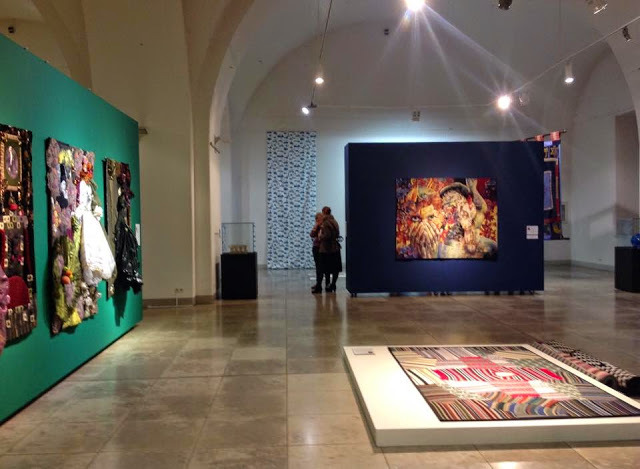 2015 - The 5th Riga International Textile and Fiber Art Triennial to the theme " DIVERSITY &UNITY ", Museum of Decorative Arts and Design, Riga, Latvia. 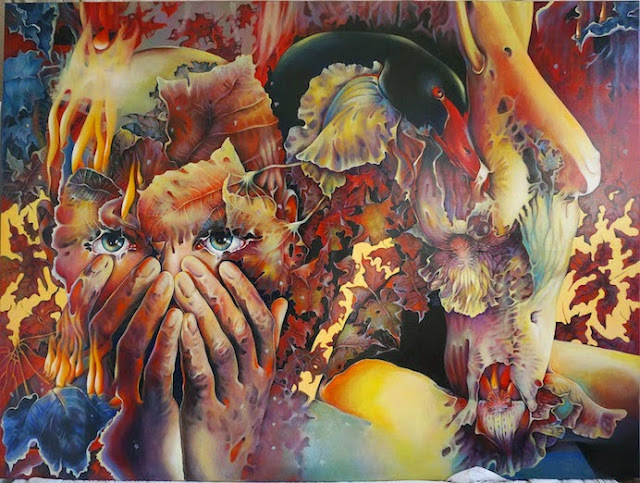 2016 - " Desenul dupa Brâncusi "National Exhibition, Tg. Jiu, Romania. 2016 - SALOANELE MOLDOVEI, Contemporary Art Museum George Apostu - XXIV edition, Bacāu, Romania. 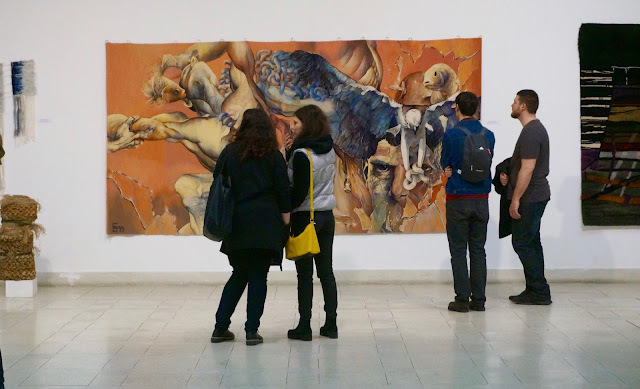 2016 - International Biennial of Miniature Art - Faculty of Arts and Design Timisoara, Romania. 2016 - ATB11 at the Mulvane Art Museum, Topeka, Kansas, SUA. 2016 - DECORATIV ART- Decorativ Art Biennial at the Palace of Parliament, Bucharest Romania. 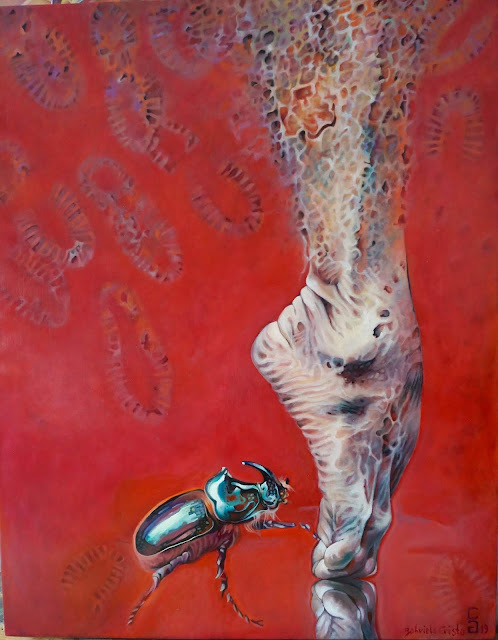 2017 - Winter Salon XV, Orizont Gallery, Bucharest, Romania. 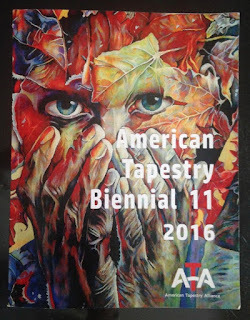 2017 - ATB11 - at the San Jose Museum of Quilts & Textiles, California, USA. 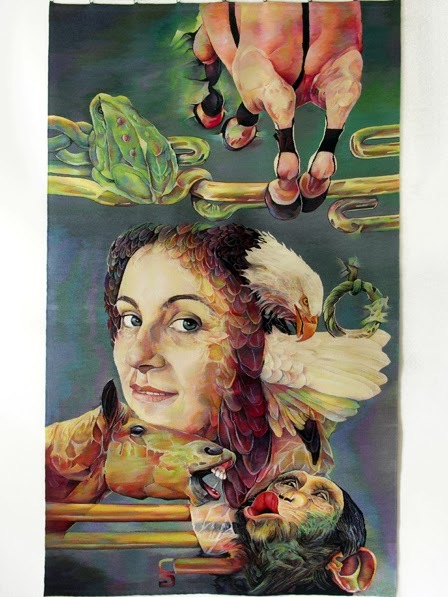 2017 - Gabriela Cristu Sgarburā & Gheorghe Zārnescu Tapestry & Sculpture. 2017 - "The Best of " decorativ art, group exhibition, Orizont Gallery, Bucharest, Romania. 2019 - International Textile Art Biennial, GC " Den Breughel ", Haacht, Belgium. The poster of the Exhibition, Museum of Art, Piatra Neamt. Museum of Art Piatra Neamt, Romania. April 21 - June 1, 2017. Emil Nicolae, Violeta Dinu, Gabriela Cristu, Gheorghe Zarnescu. Tapestry cardboard and the wood artworks.
" 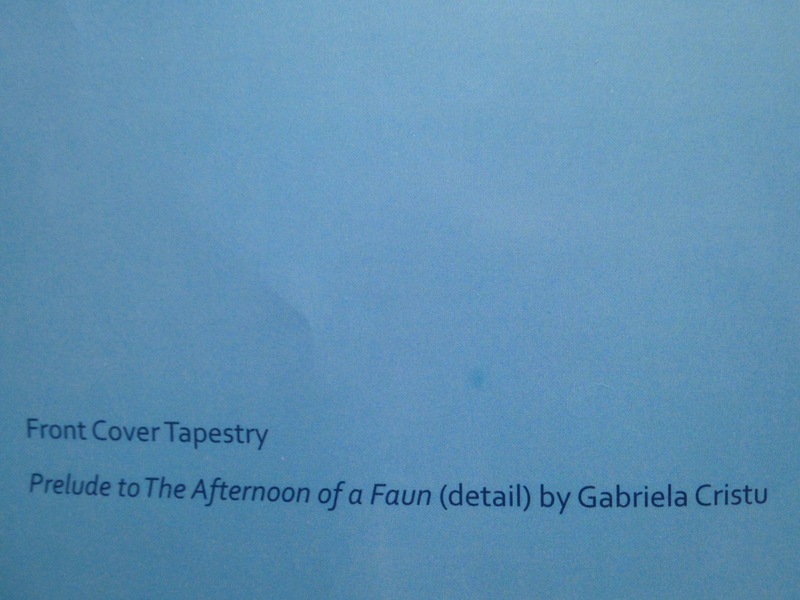 PRELUDE TO THE AFTERNOON OF A FAUN " tapestry. 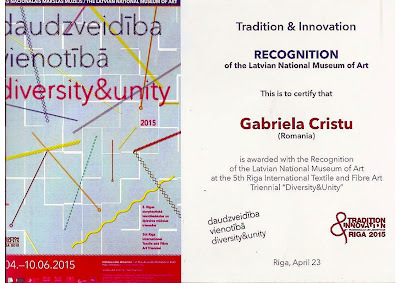 Gabriela Cristu - Recognition of the Latvian National Museum of Art. 2006 -Tapestry Biennial ARELIS, l'Espace Saint Pierre des Minimes, Compiègne, France. 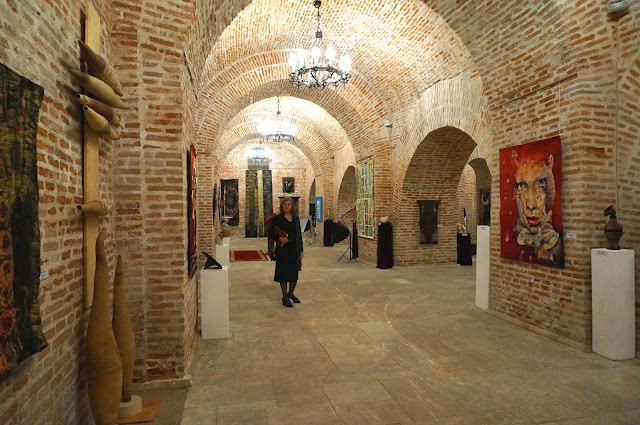 City Gallery, Suceava, Romania - 2014. Decorativ Arts Biennial at the Palace of Parliament, Bucharest, Romania. 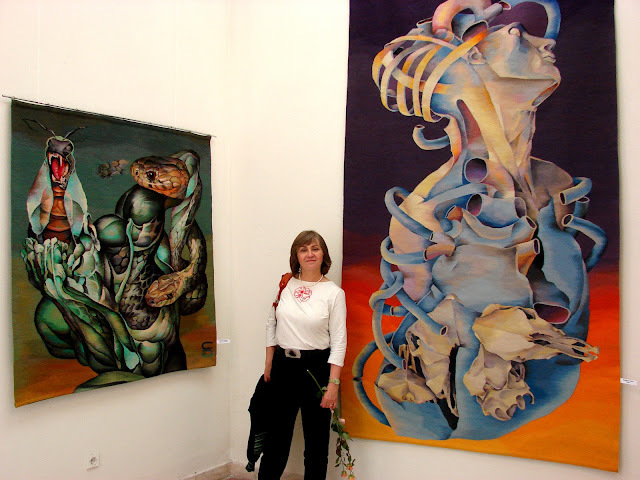 2010, Budapest, " Web of Europe " exhibition. My work in " Web of Europe " exhibition. 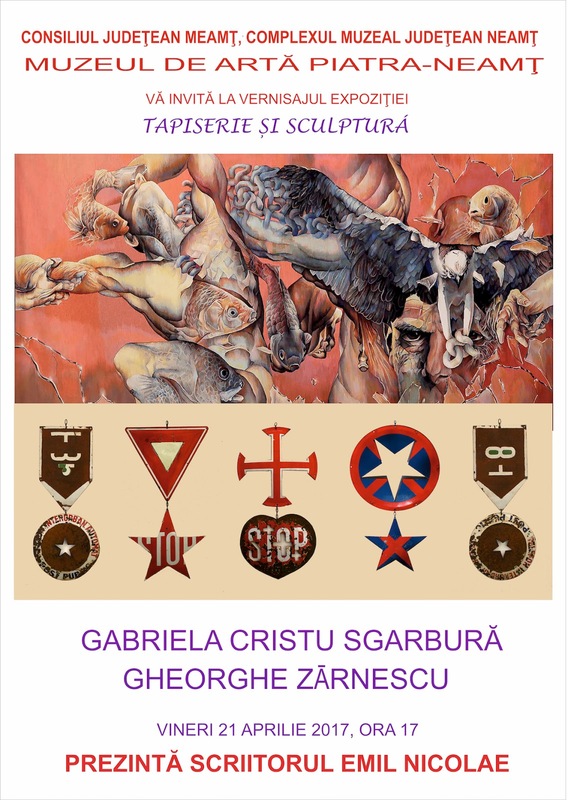 1990 Gabriela Cristu solo-show opening, Art of Museum, Cluj-Napoca, Romania. 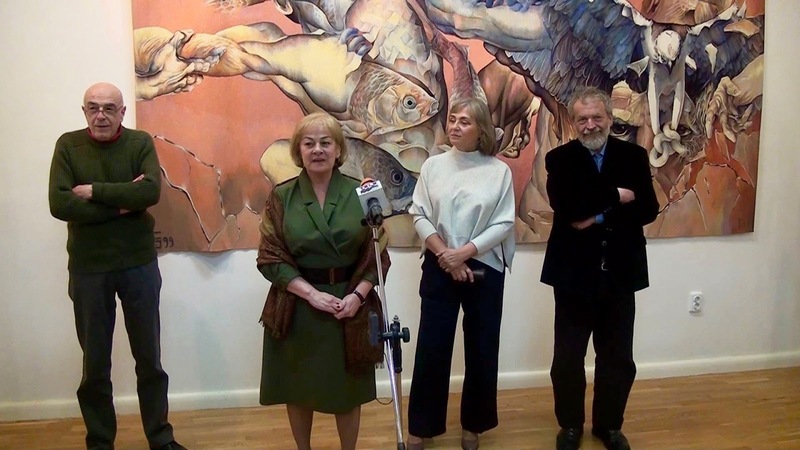 Mircea Muthu, Velica Boari, Gabriela Cristu, Ana Maria Baltaru. 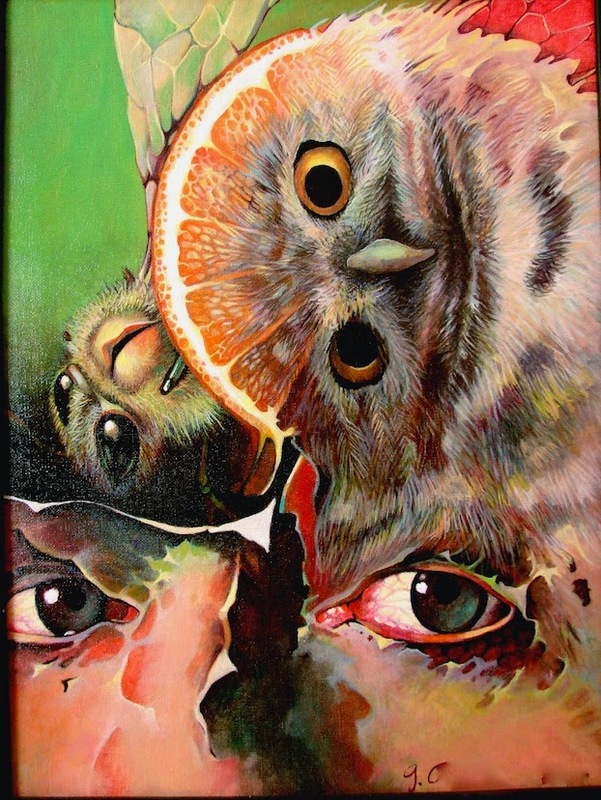 oil on canvas, 40 / 30 cm, 2004. © DON'T TURN IT OVER ! UNIVERSE FRAGILE ! NU RASTURNATI ! UNIVERS FRAGIL ! 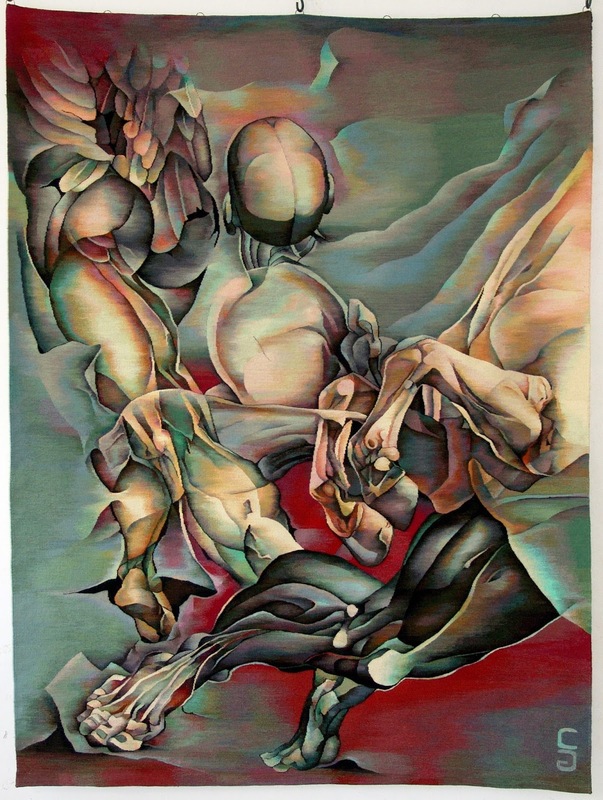 drawing crayon on paper, 38 x 45 cm, 1981. Doua obiecte spatiale- carton cofraj. Miniatural Art, 11 / 12 / 11 cm, 2016, Faculty of Arts and Design, Timisoara, Romania. A page of the catalog Nordart 2014 , Kunstwerk Carlshutte, Germany. 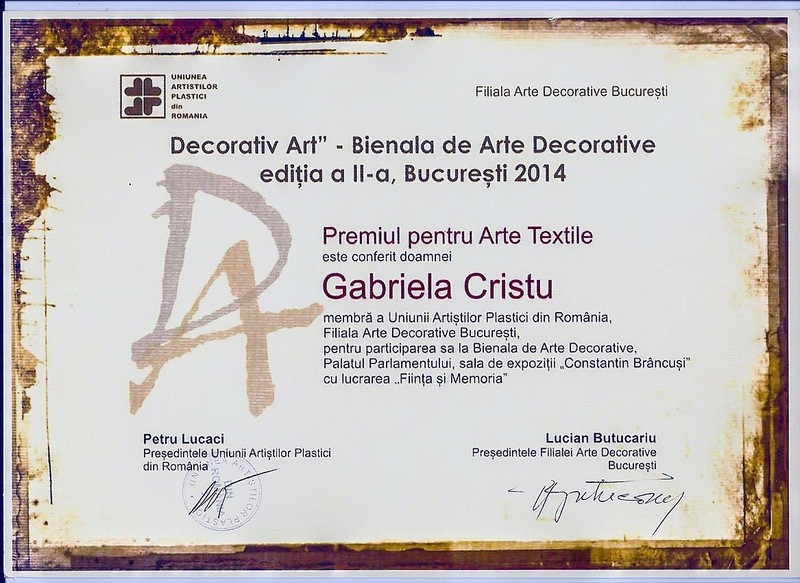 2014 - The Prize for Tapestry of Decorative Art Biennial, Bucharest, Romania. 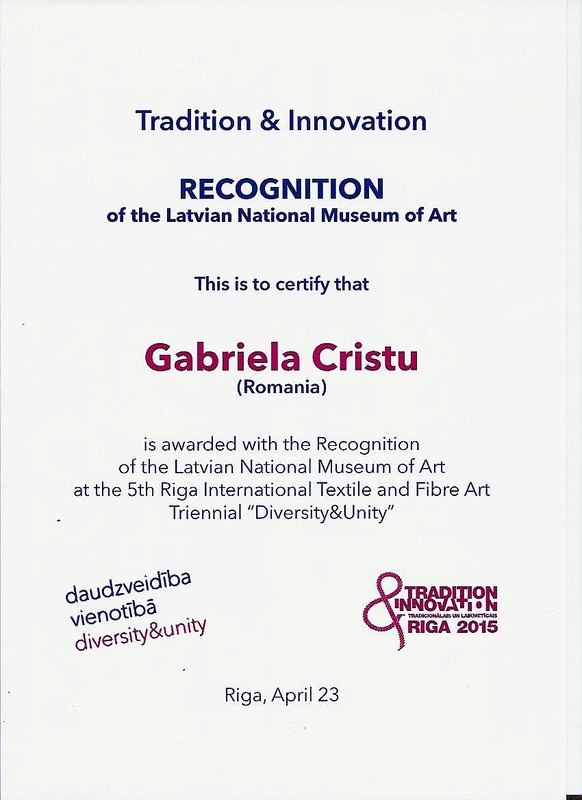 2015 - 5th International Fiber Art Triennial Catalog and the Prize of National Latvian Museum, Riga, Latvia. 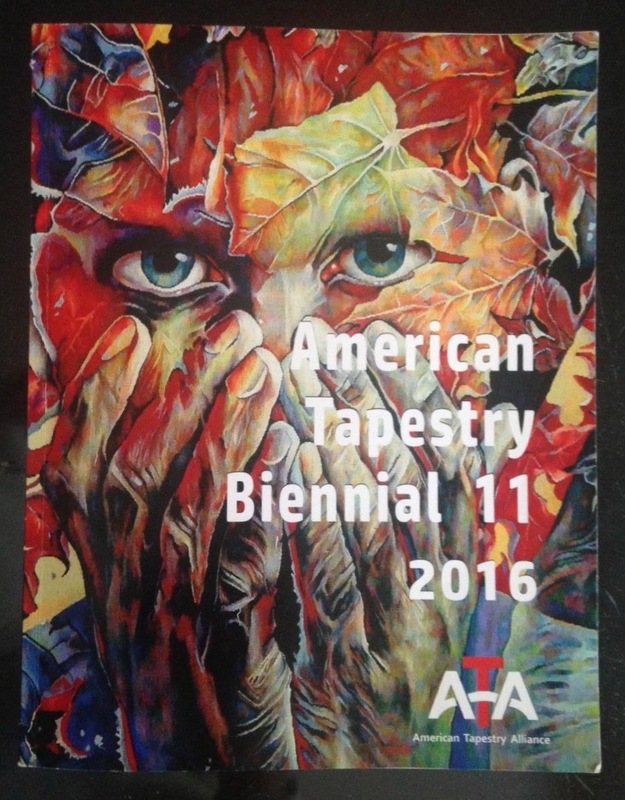 The American Tapestry Biennial 11 Catalog.
" 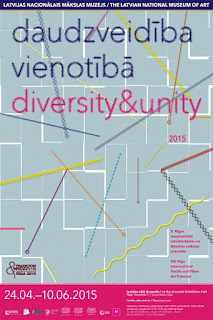 DIVERSITY&UNITY "album, 5th International Textile and Fiber Art Triennial, Riga, Latvia. 2015. 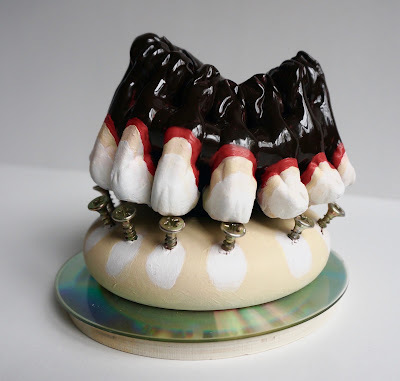 + "NordArt 2014 - The International Exhibition " catalog, KUNSTWERK CARLSHÜTTE, BUDELSDORF, GERMANY. 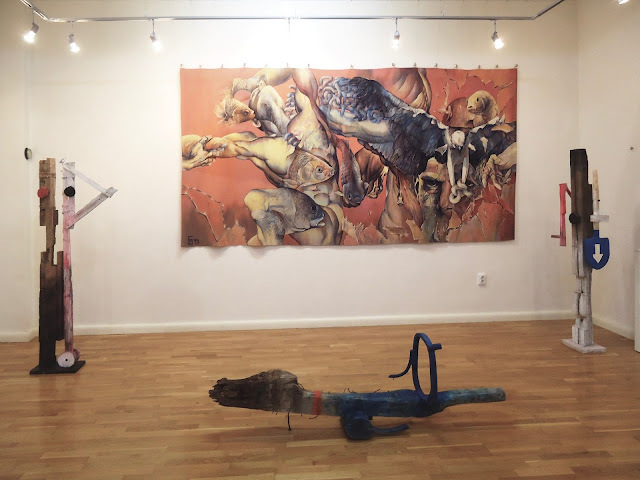 „Dreams or visions grow with the possibilities,“ exhibition organizer Wolfgang Gramm once said. The project NordArt is made possible by the right people, who have found each other at the right time and place.
" 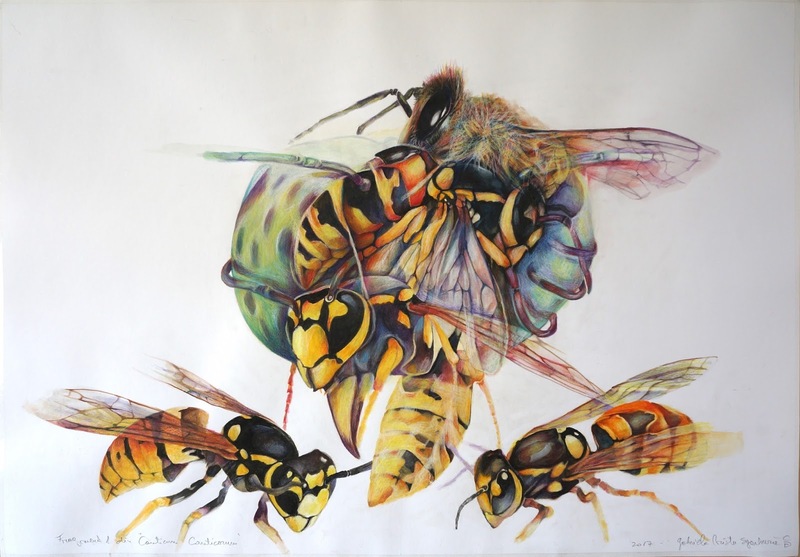 Enciclopedia Artistilor Romani Contemporani " vol. 8 in course of publication by Editura Arc 2000, Bucharest, Romania. 2014. 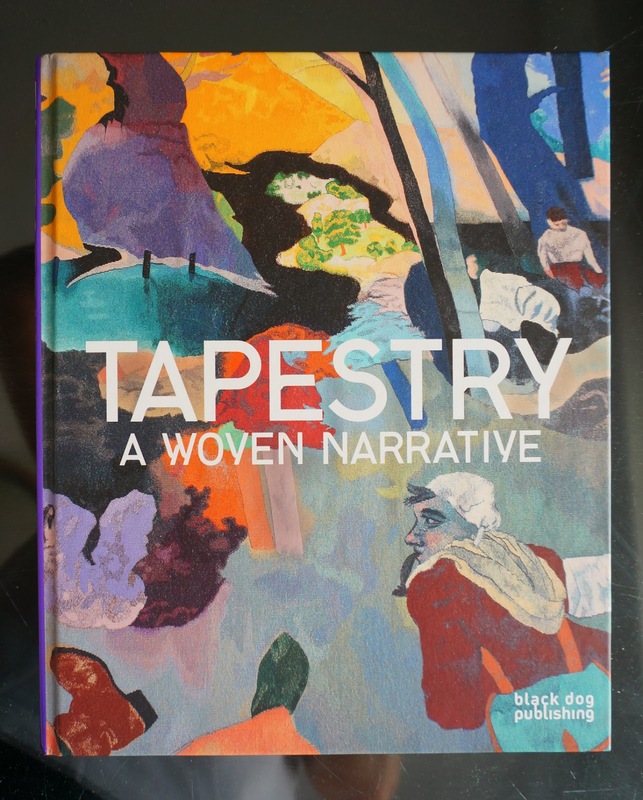 Fiona Mathison’s essay “ Tapestry in the Modern Day" in the book Tapestry: A Woven Narrative . Authors: Timothy Wilcox, Caron Penney and Fiona Mathison, Black Dog Publishing – London, UK 2012. 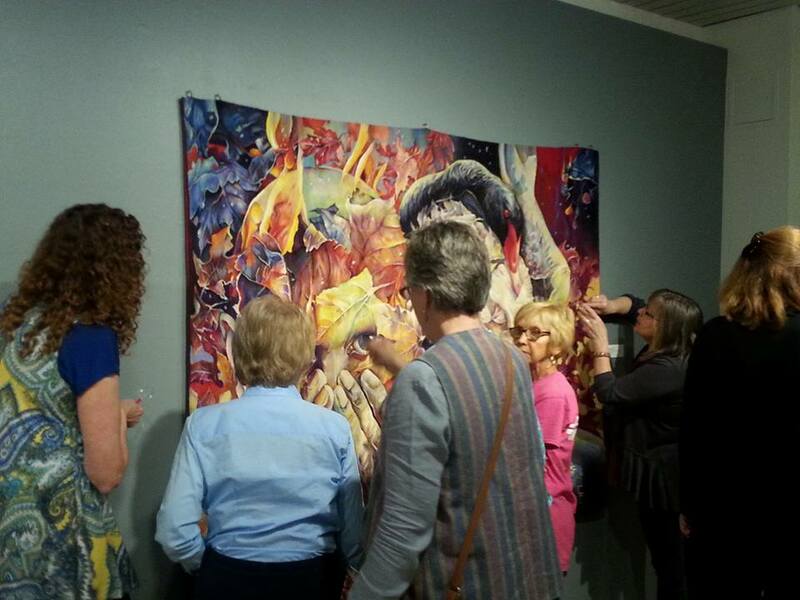 Article: " Artapestry 2, West Norway Museum Decorative Art, Bergen ",by Jessica Hemmings. 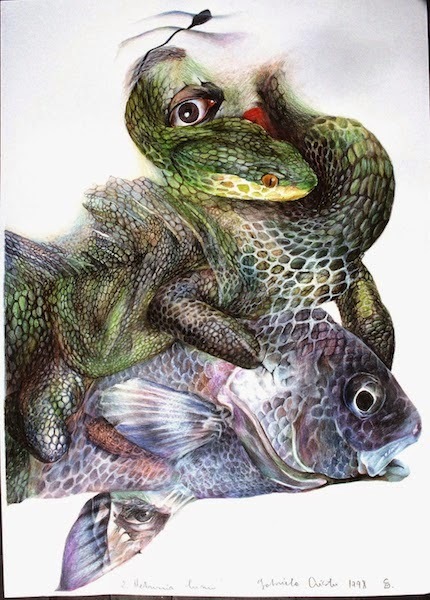 Name of the publisher : " Surface Design Journal " - Exhibition Reviews (winter 2010: 60-61 ): " (...) I am not dismissing the importance of conceptual content or the need to explore experimental techniques. But perhaps what this exhibition does best is to remind us of the beauty skilful making provides. 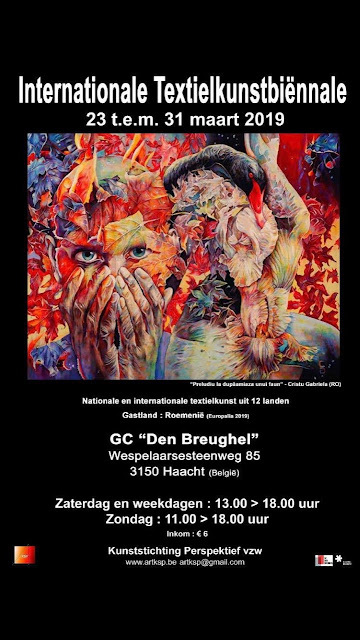 The press material for the Bergen venue, where I saw the exhibition, uses Romanian artist Gabriela Cristu' s UVEDENRODE, a poster-like reproduction of vivid colours and incredible detail that looks as though the surface could have been painted. Here the realisation that the image is not a feat of Photoshop provided a novel form of shock-value "
Article: “ The Artapestry Exhibition in Krefeld” by Beatrijs Sterk. Name of the publisher: TEXTILEFORUM, 2nd June 2006, Germany. 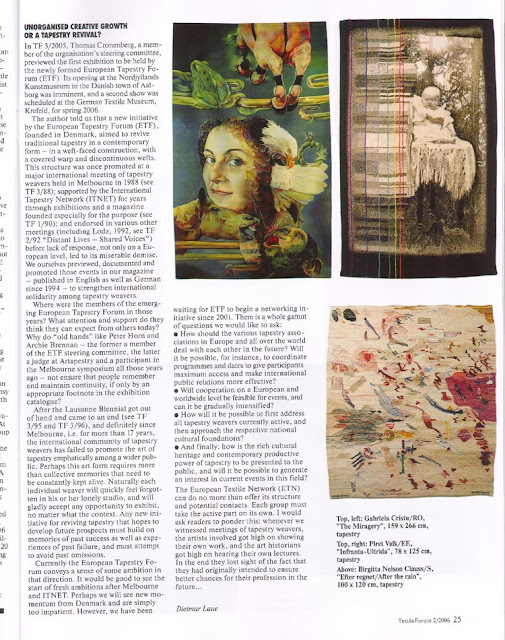 Article: ” Historical and Contemporary Tapestry.Reflections on Fascinating Similarity and Differences” by Elsje Janssen. Name of the publisher: the catalogue of exhibition KARPIT 2 - 8th November 2005,Hungary. 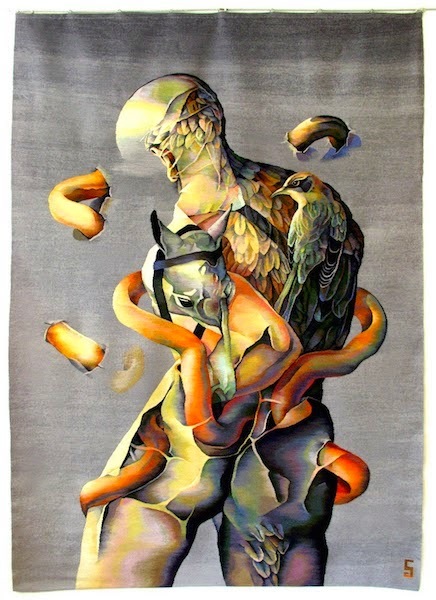 Article: “ Metamorphosis”- Tapestry now” by Edith Andras. 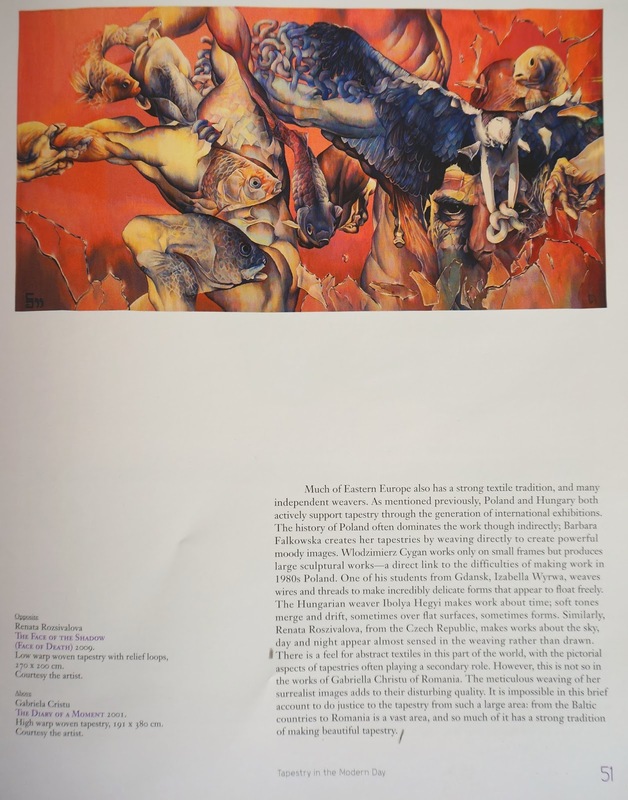 Name of the publisher : the catalogue of exhibition KARPIT 2 – 8th November 2005, Hungary. Article: “ Tapisseries Contemporaines au Chateau de Pyguilhem” by Jaques Hodgson. Name of the publisher : ECHO DE LA DORDOGNE ,july 15th 1993, Villars. 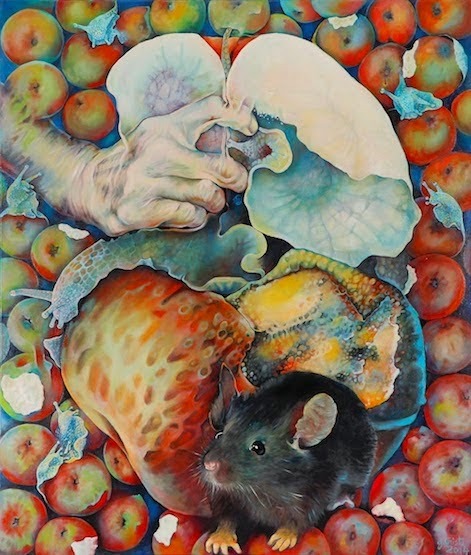 Article: “Romanian Journey” by Linda Lewis. Name of the publisher: INTERNATIONAL TAPESTRY JOURNAL ,winter 1997, U.S.A. 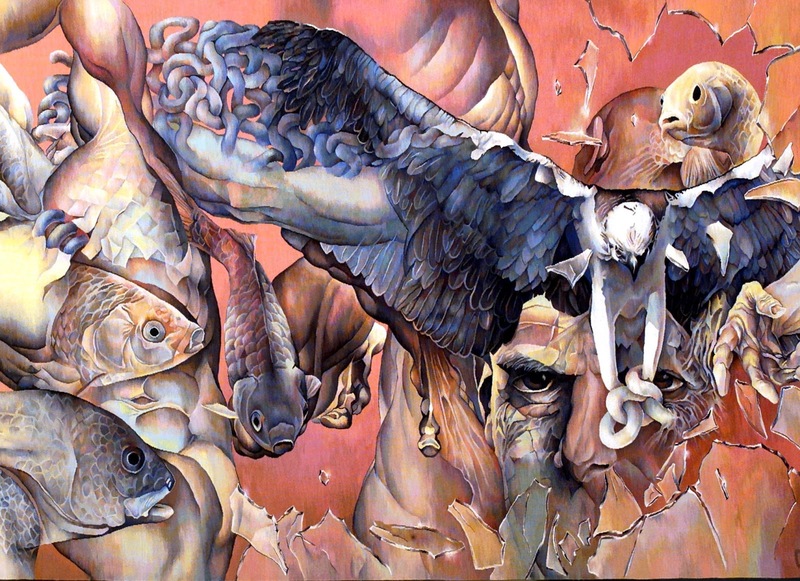 Article: “ Simtul echilibrului – un atu “ by Constantin Hostiuc. 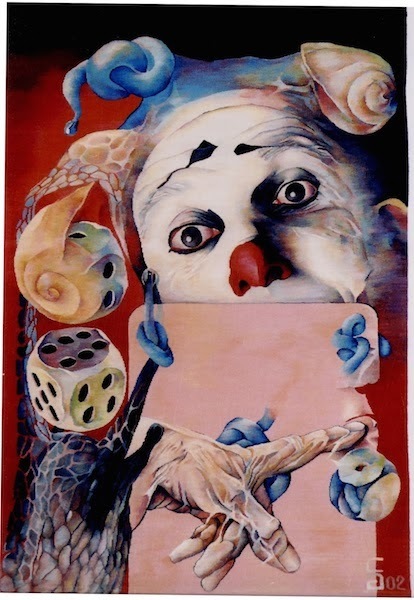 Name of th publisher : AD ARHITEXT DESIGN, August 1998, Bucharest. Article: “ Ipostaze si metamorfoze ale fiintei “ by Corneliu Antim. Name of the publisher : CURENTUL, July 15th 1998,Bucharest. 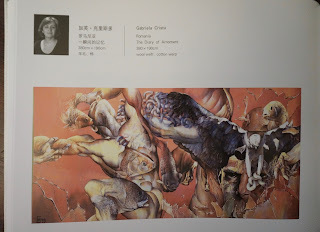 Article: “Gabriela Cristu, la cel de-al IV-lea Festival International de Tapiserie de la Beauvais” by Ion Andreita. Name of the publisher : ROMANIA LIBERA, July 2000, Bucharest . Name of the publisher: in the book “ SCRISORI PARIZIENE ” –by Ion Andreita, editura “Silviu Popescu”, 2000, Ramnicu Vilcea ( pag. 249 ). Article: “Urzeala si ecorseu” by Dorana Cosoveanu. Name of the publisher: OBSERVATORUL CULTURAL”, Juin 25th – 2002, Bucharest. Article: “Tapiseria ca demers filozofic” by Valentin Tanase. Name of the publisher: DOMUS 17th Decembre 2003,Bucharest. 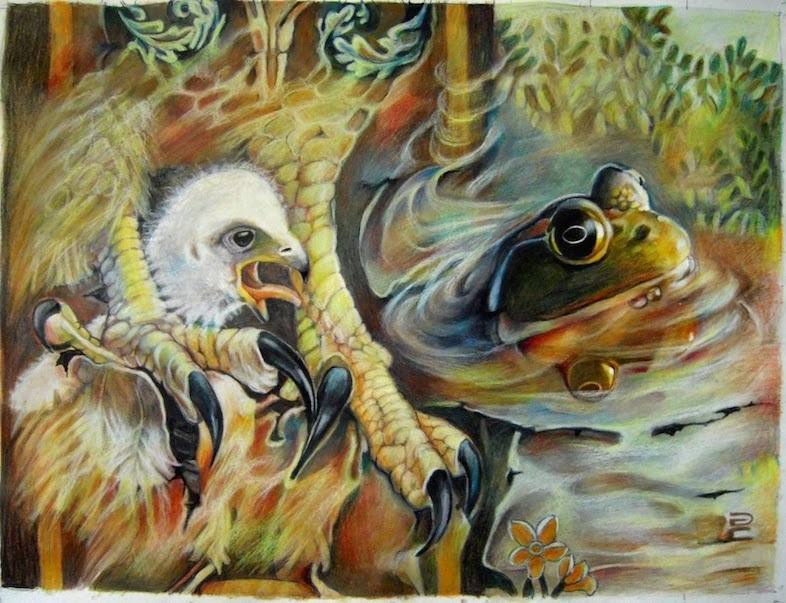 Article: “ Incursiune in mineral “ by Aurel Antonie. Name of the publisher: TRIBUNA,April 9th 1987, Craiova, Romania. Article: “Un talent disciplinat si sigur” by Tudor Octavian. Name of the publisher :FLACARA,November 8th 1985,Bucharest. 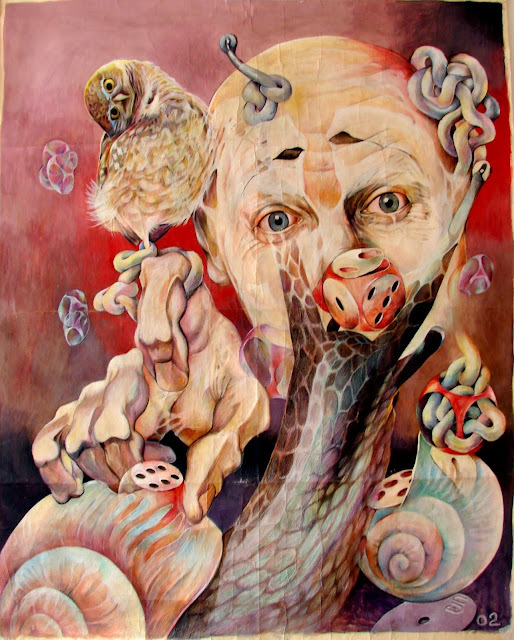 Article:”Jurnalul galeriilor” by Virgil Mocanu. Name of the publisher: ROMANIA LITERARA,October 31st 1985,Bucharest. 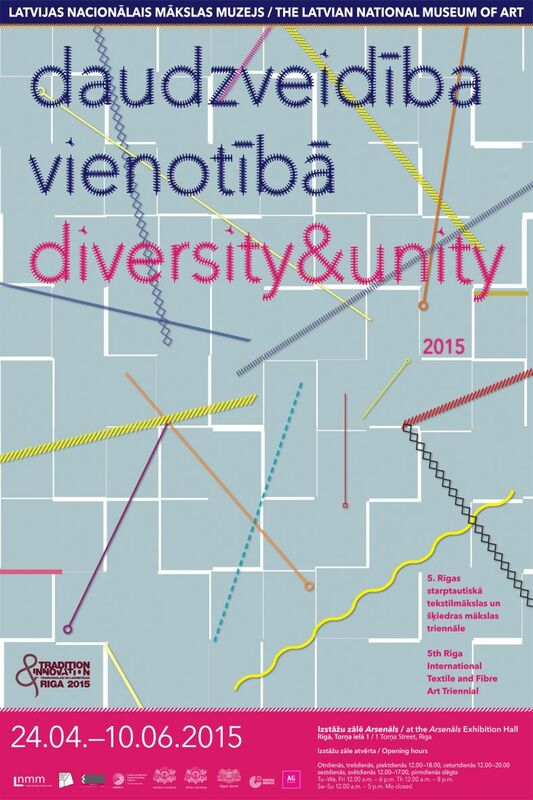 Article : "Artapestry 2 - On the way to becoming a Northern European Triennial ", report by Thomas Cronenberg. ETN Textile Forum Magasine ( TF 3 / 08 2008 ). 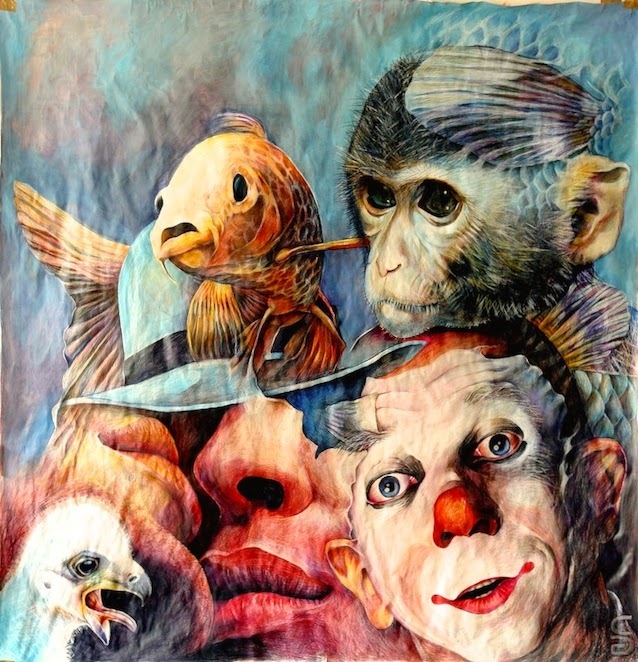 ( Photos by : Armand Rozenthal, Marius Caraman, Daniel Gora, Radu Sgarbura, Gabriela Cristu ). 2005-2006. 158 / 196 cm. 146 / 170 cm, 2005. 148 / 145 cm, 2005.
drawing on paper, 100 / 70 cm, 2006.
drawing on paper, 50 / 70 cm, 1998. © FRAGMENT 1 of " CANTICUM CANTICORUM"
oil on linen, 120 / 160 cm, 2013.
oil on canvas, 125 / 100 cm, 2012.
oil on canvas, 125 / 100 cm, 2014.